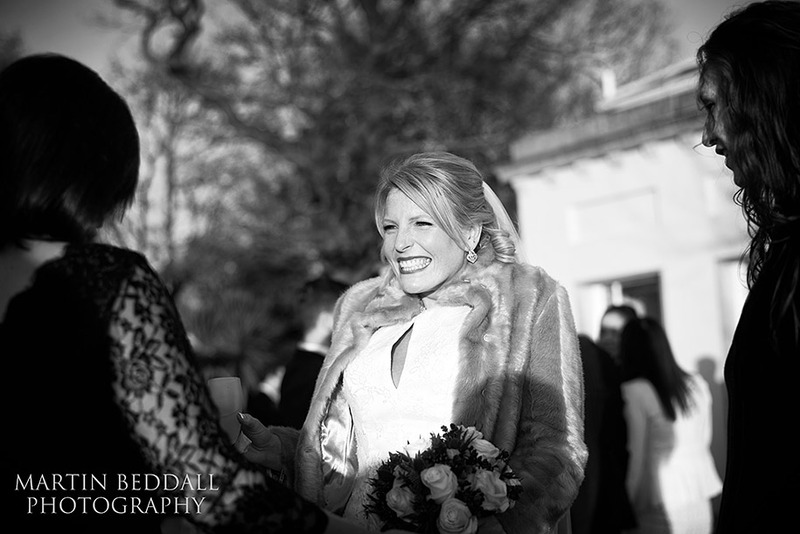 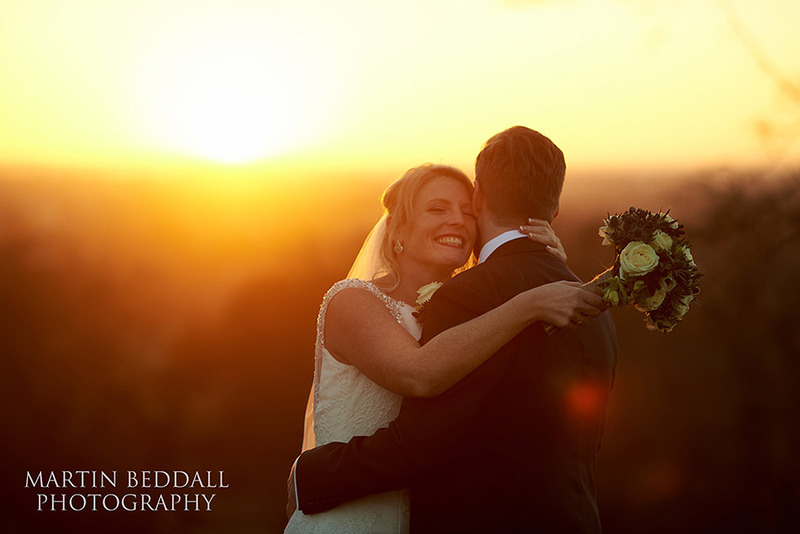 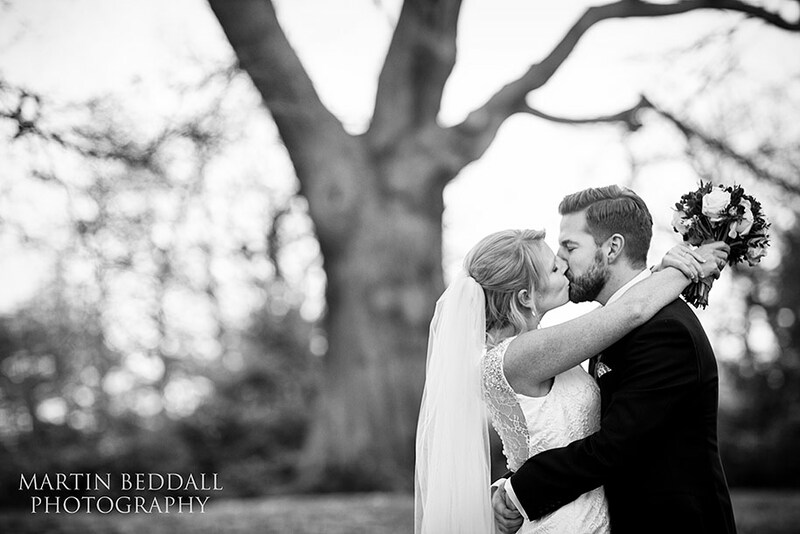 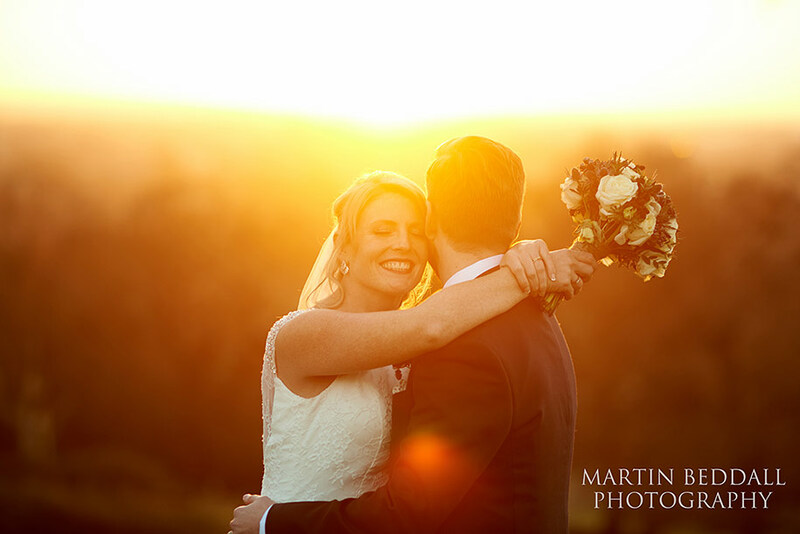 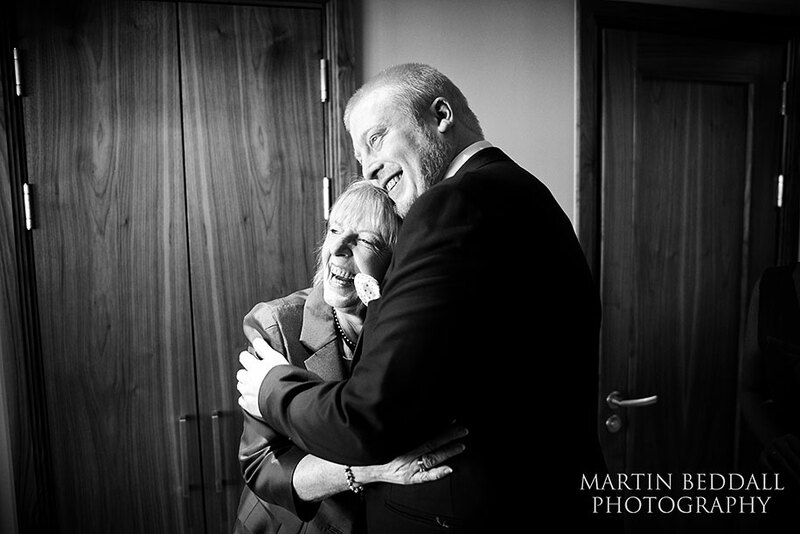 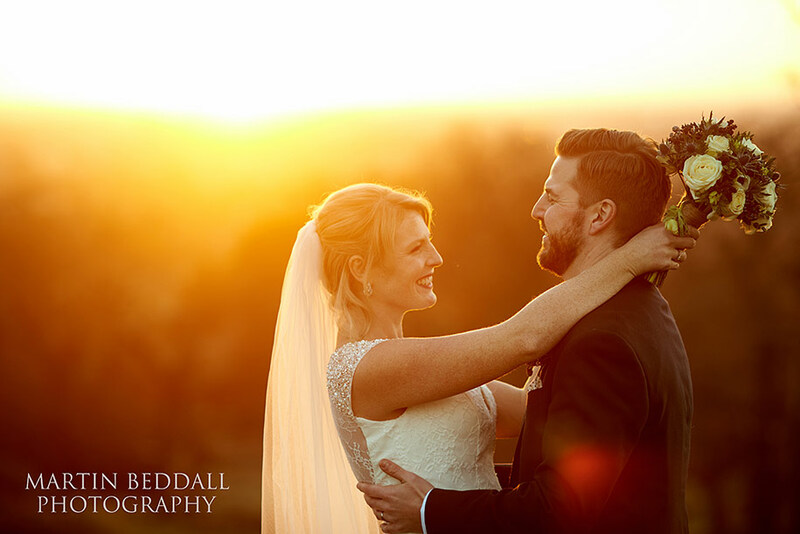 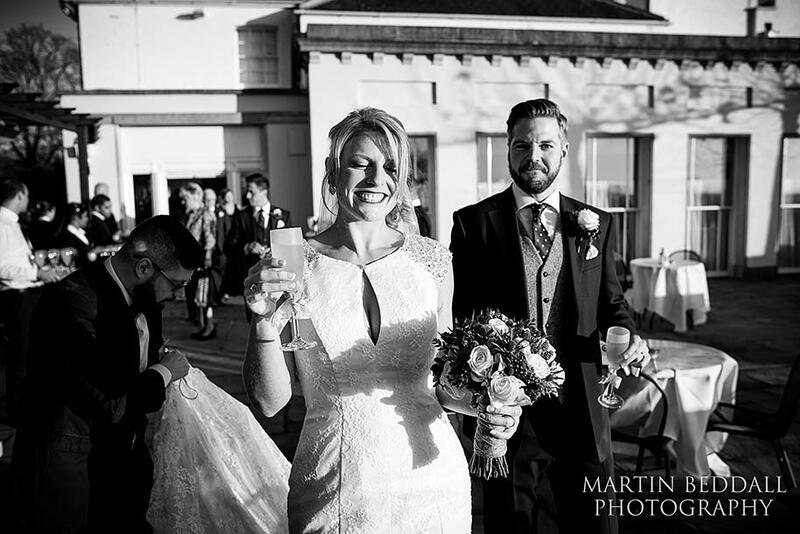 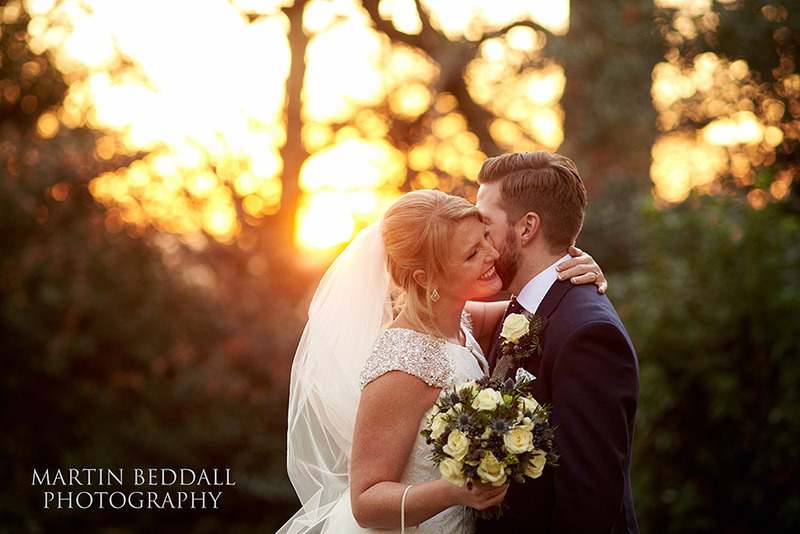 Wedding photography at a winter wedding – usually it means battling the rain, sleet or snow and certainly the gloom, but sometimes the weather in winter plays a blinder! 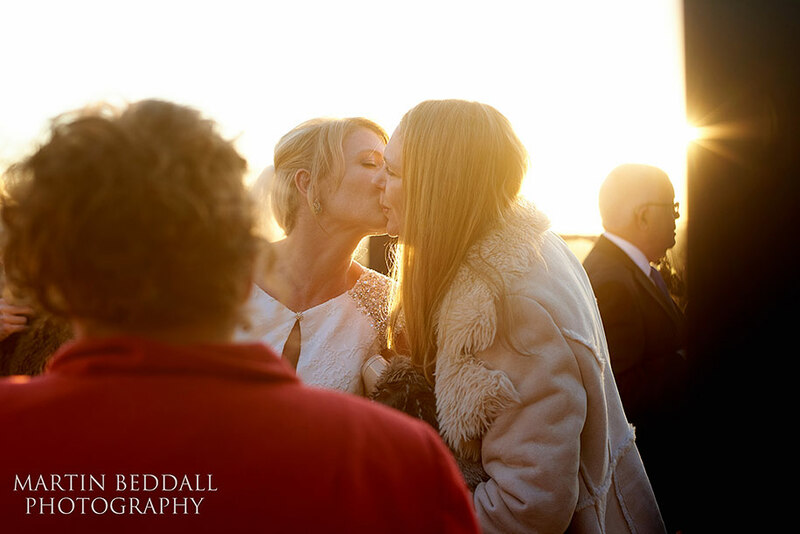 With the ceremony due to finish by 3pm, it was always going to be a race with the light. 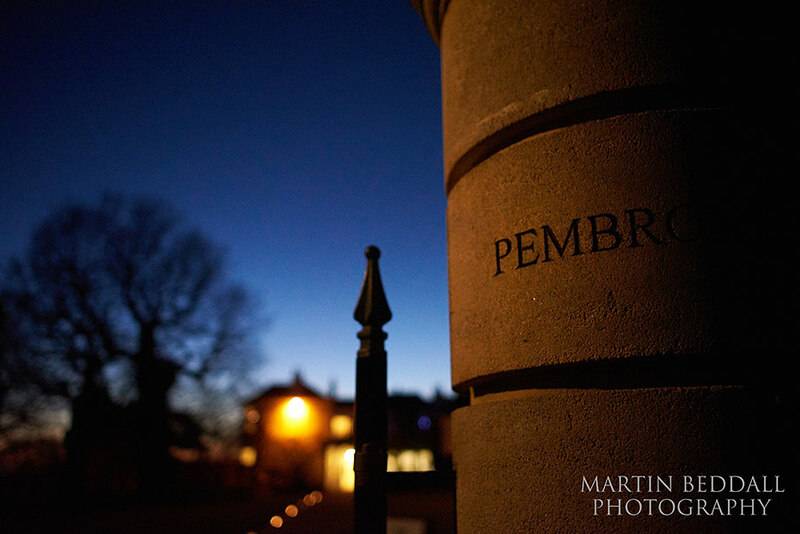 The daylight goes out quick at this time of year. 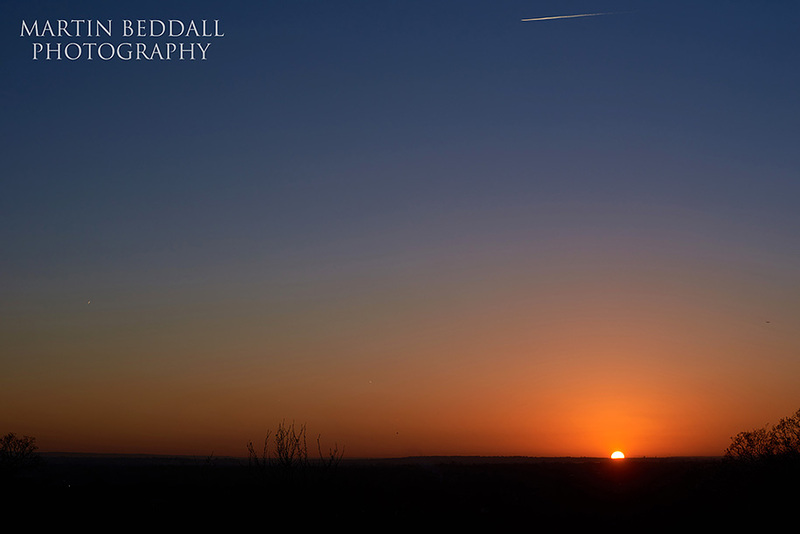 The sun actually dipped behind the horizon at ten to four!. 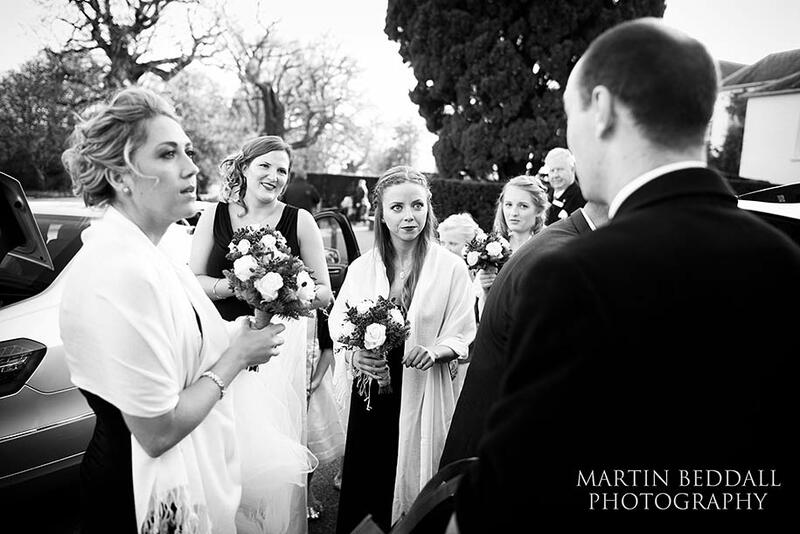 To add to the pressure, the ceremony started fifteen minutes late. 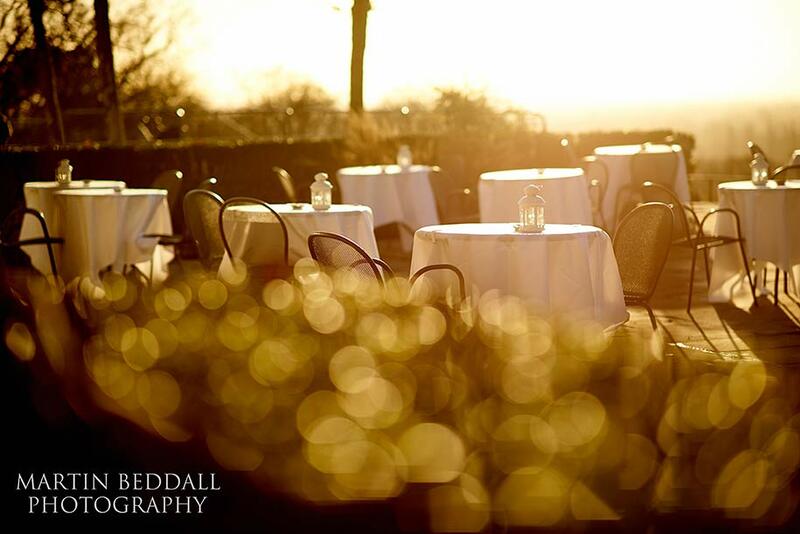 But although the time was brief and the air a touch cool, the terrace at Pembroke Lodge bathed in golden sunshine is the sort of weather you would hope for in the summer. 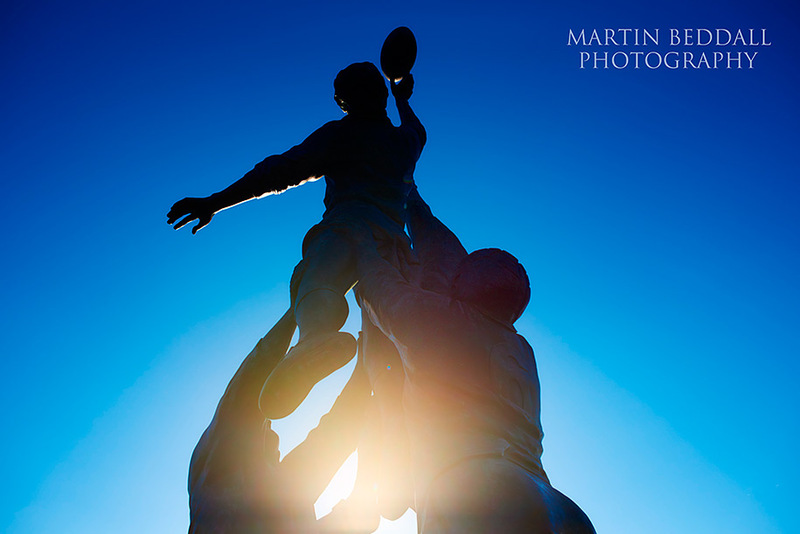 It was clear blue skies at Twickenham stadium a couple of hours earlier, where coverage began at the Marriot hotel there. 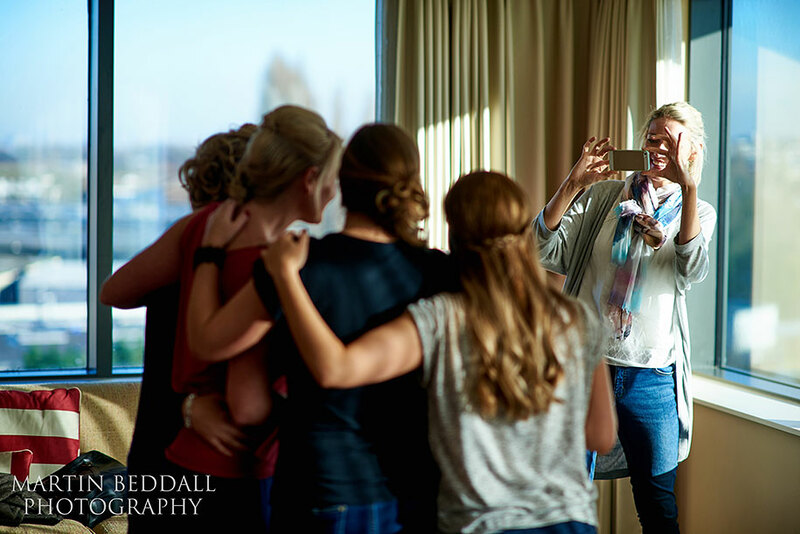 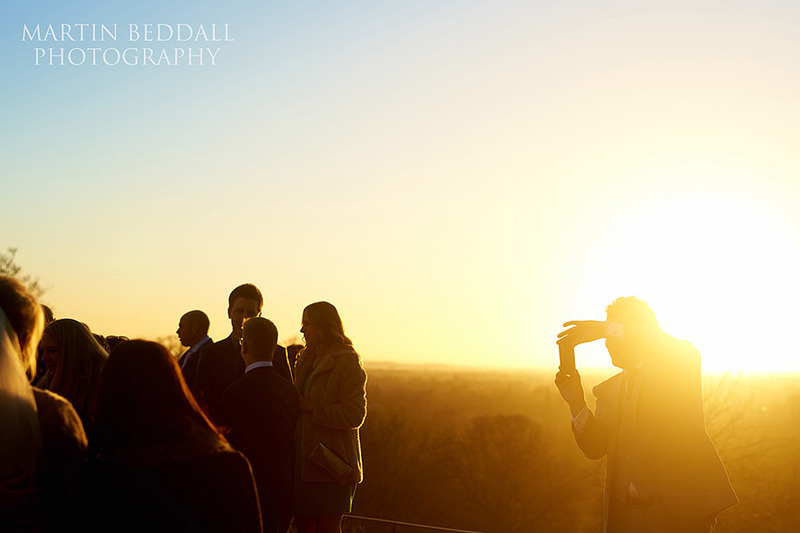 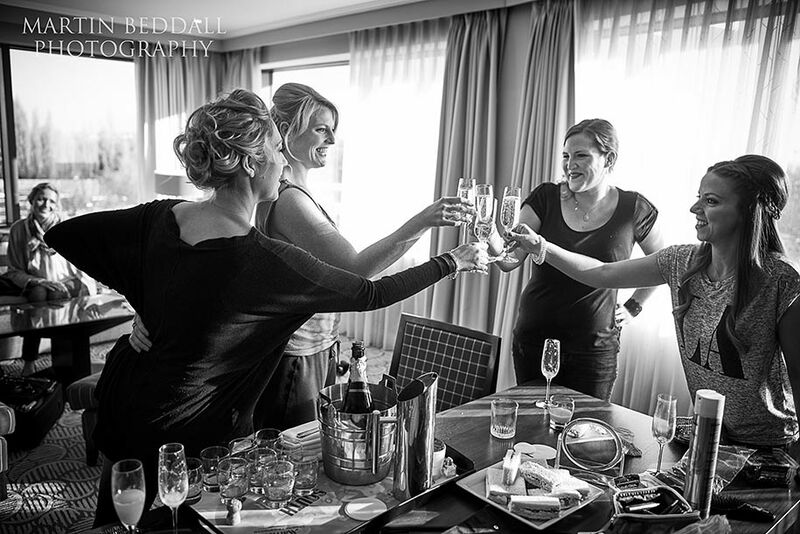 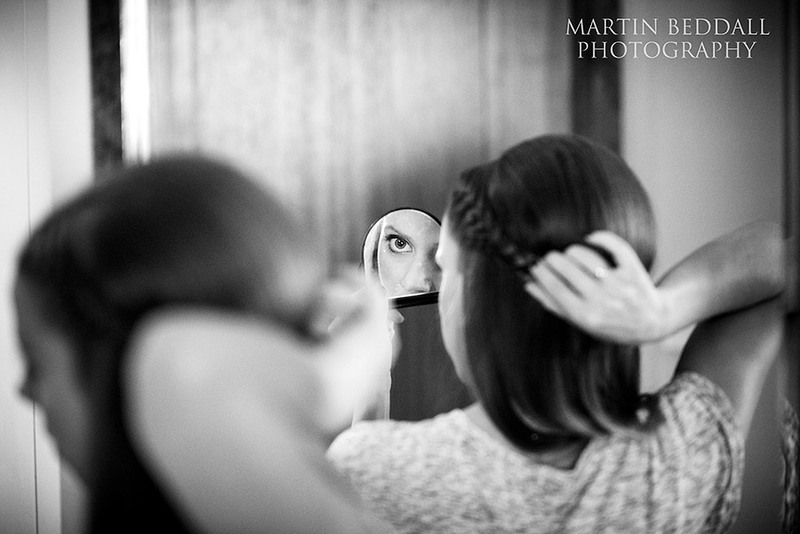 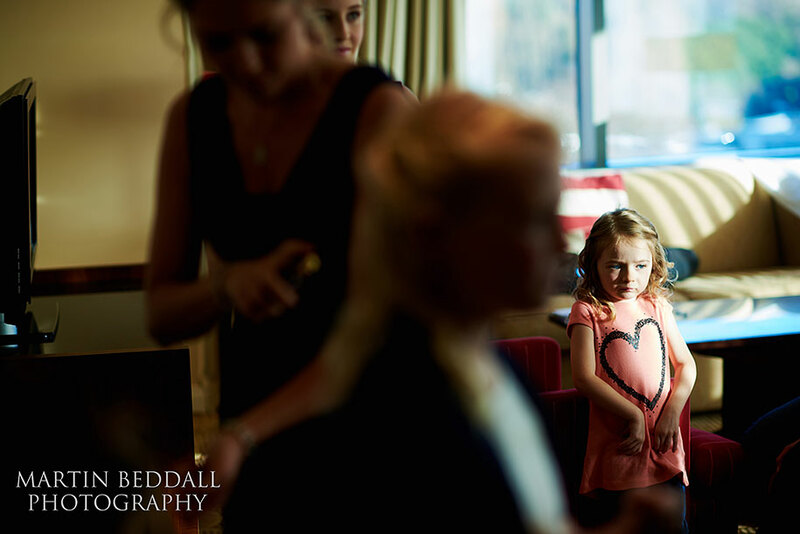 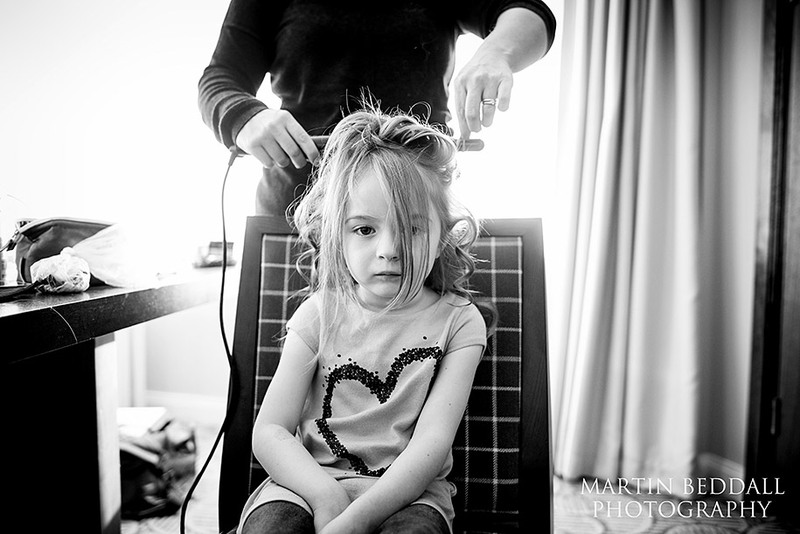 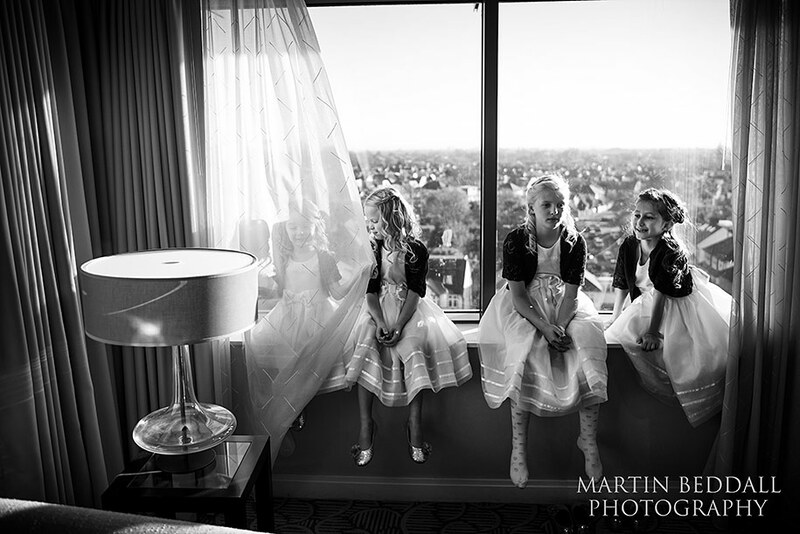 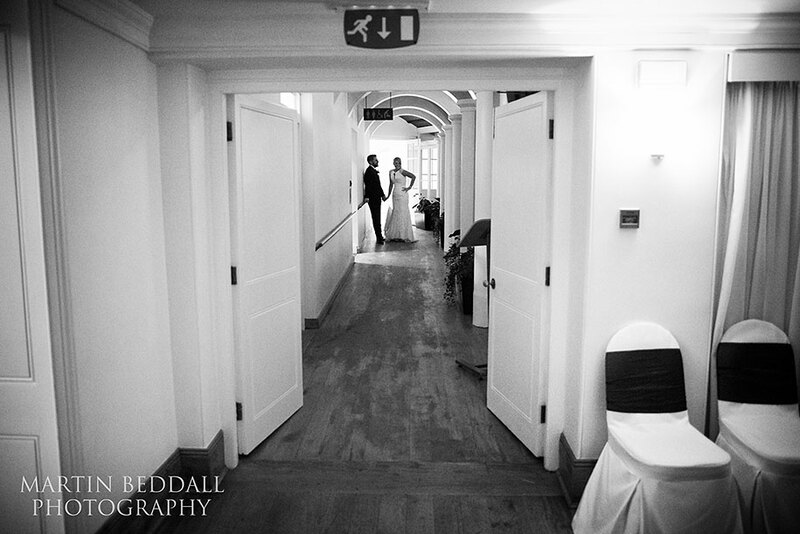 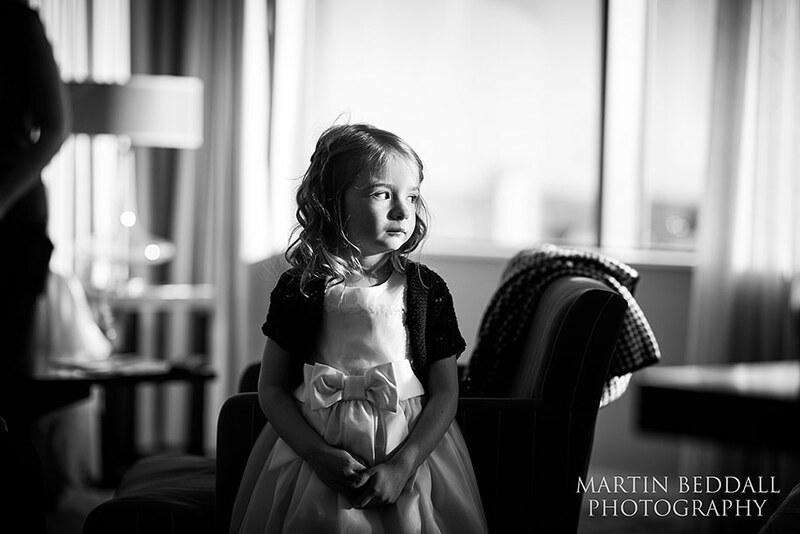 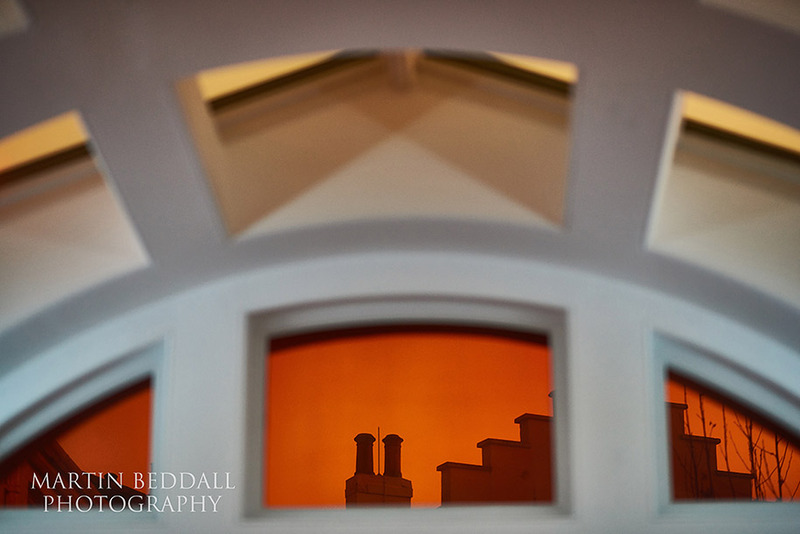 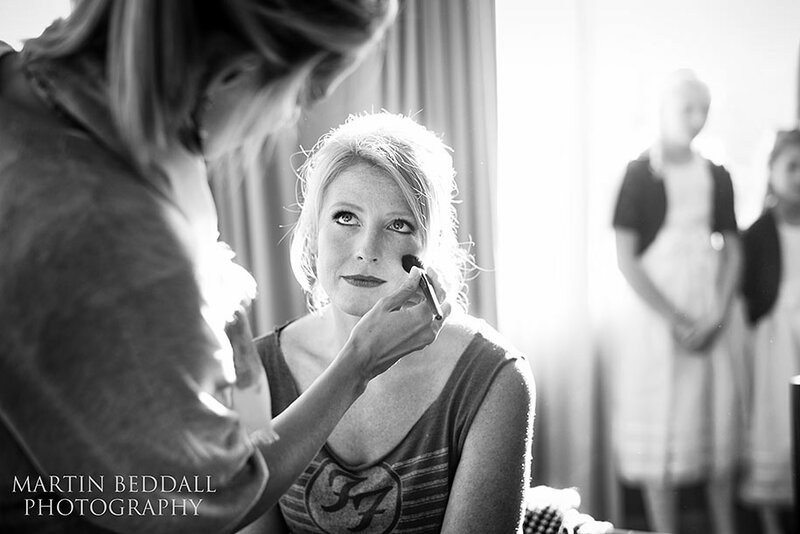 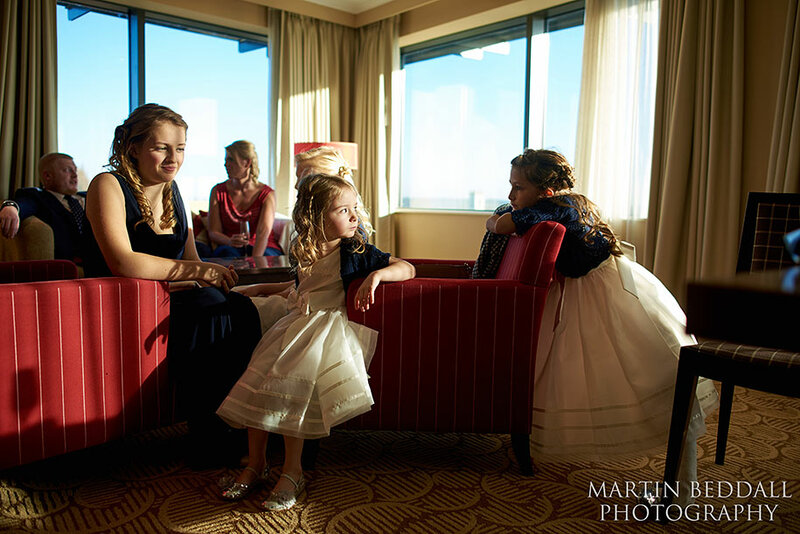 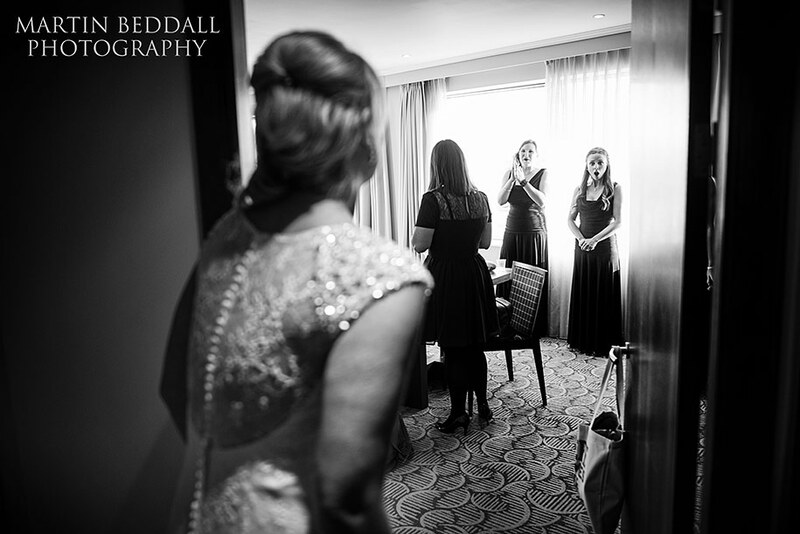 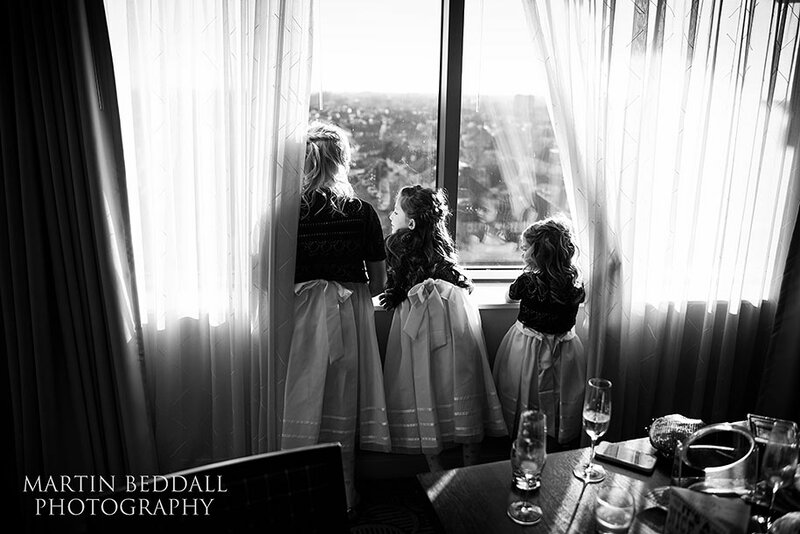 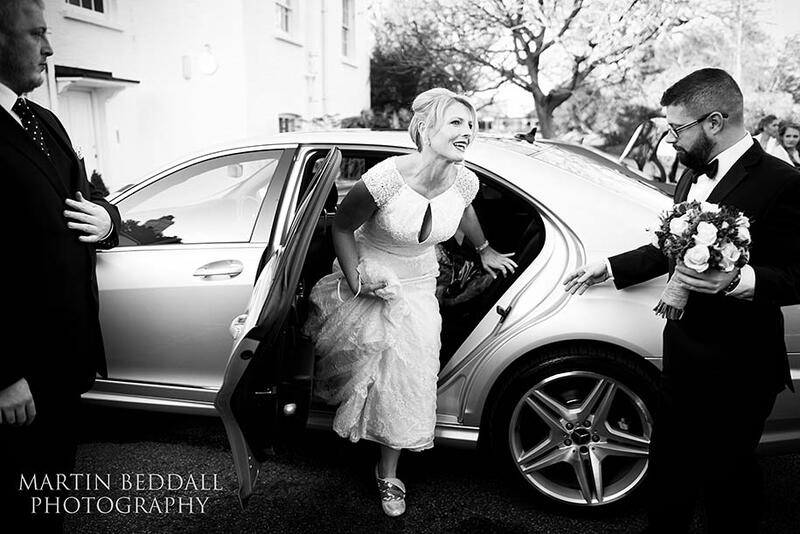 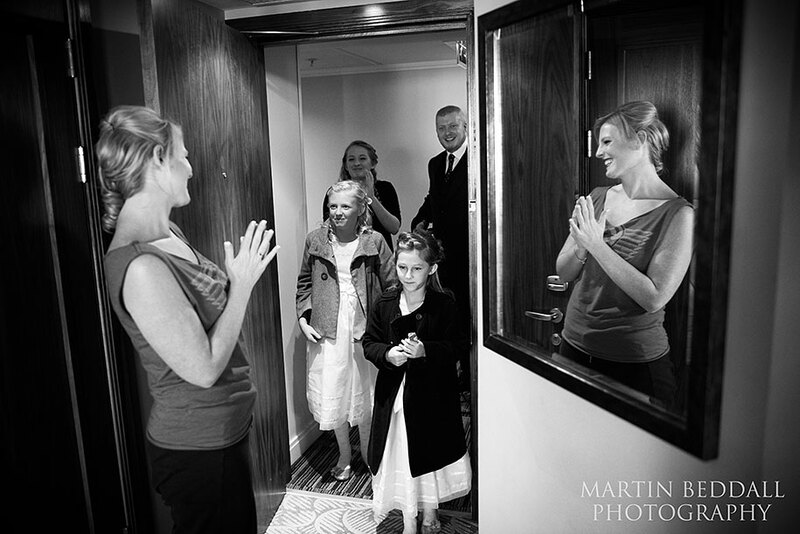 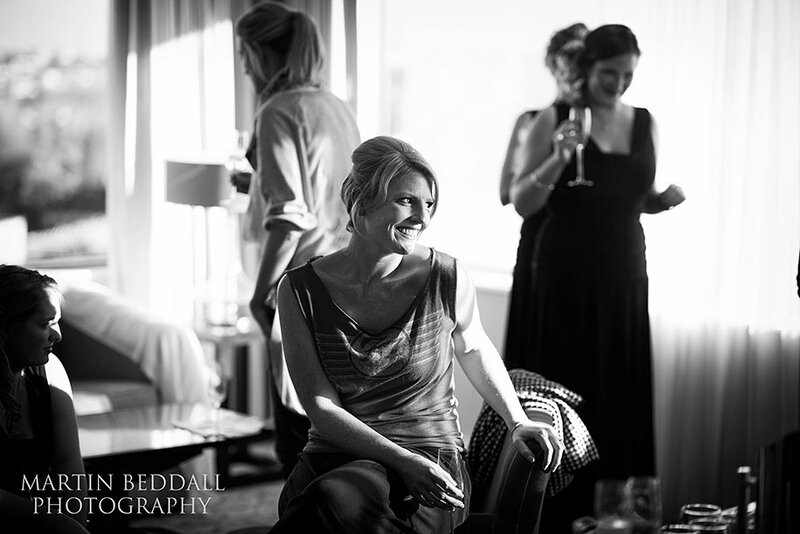 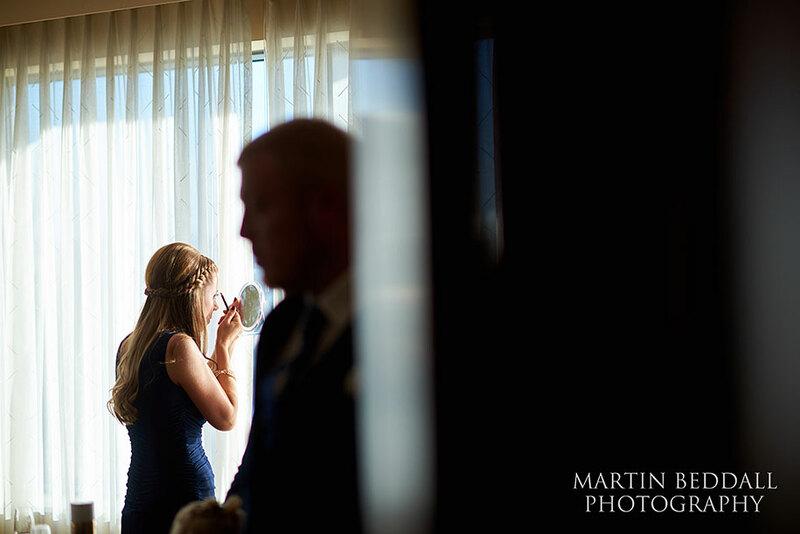 Up on the fifth floor, with a view across to Richmond Park, Sarah got ready with family, bridesmaids and flower girls. 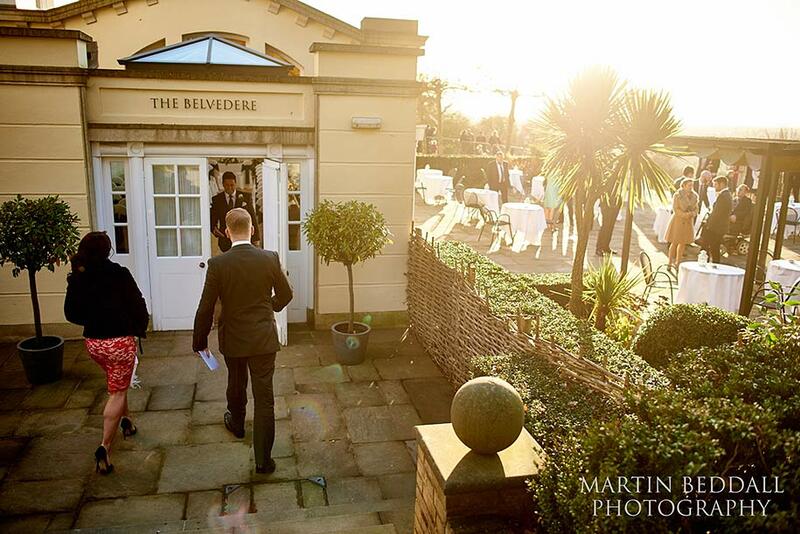 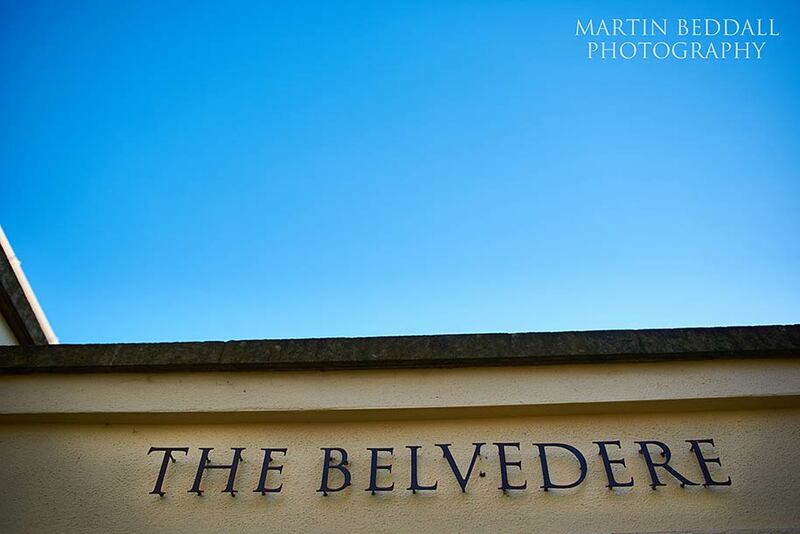 A short trip through the usual Saturday traffic jams that surround Richmond and on to the ceremony in The Belvedere. 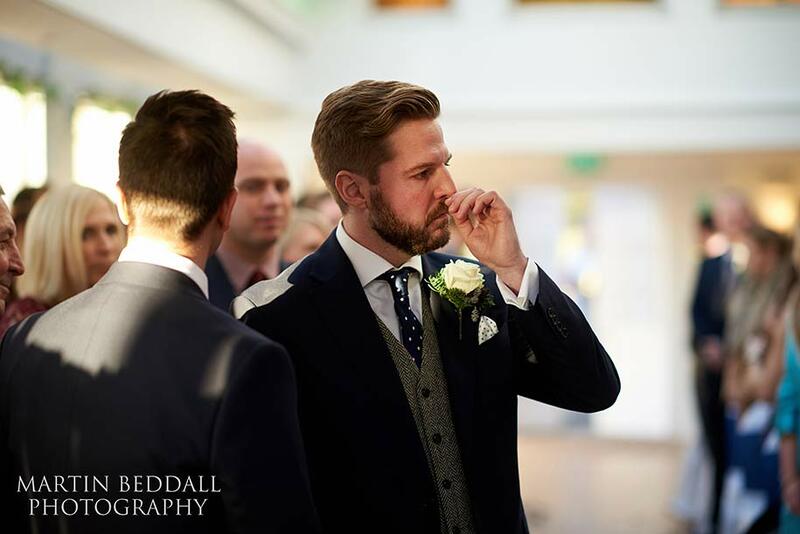 Waiting inside, the nerves were beginning to show on Russell’s face and when he turned to see Sarah enter with her brother, the emotions welled up for him. 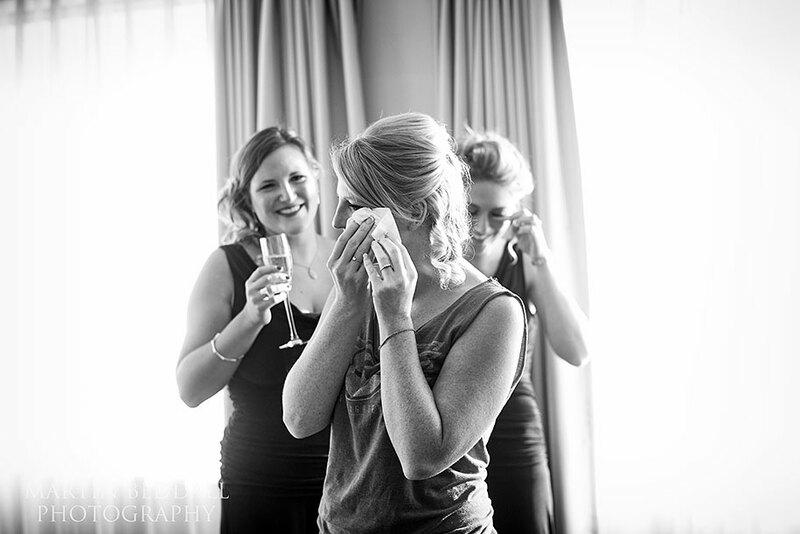 Sarah had had to grab a tissue during preps too! 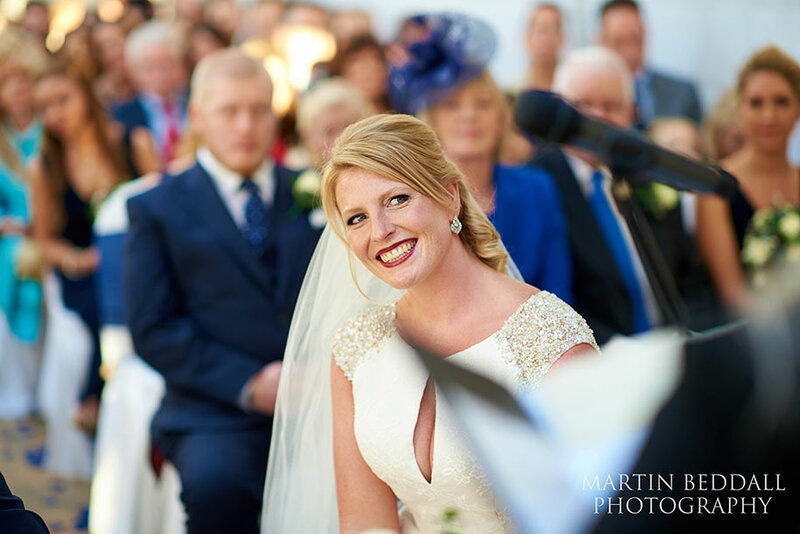 With a Christmas tree and some wintry decorations in the place where you would usually stand to photograph a ceremony in the Belvedere, it was lucky that the registrar had no problem with me shooting over her shoulder ( helpful that she wasn’t very tall too! 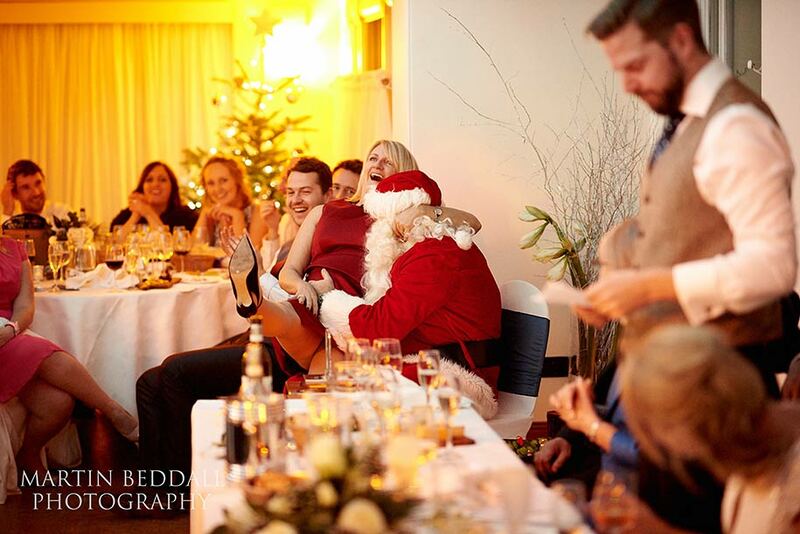 😉 ) Not the most discreet position but the only one to use. 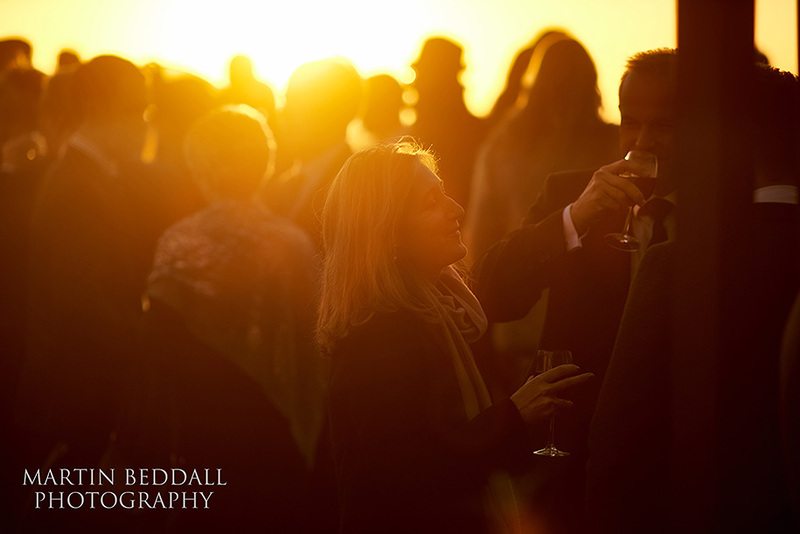 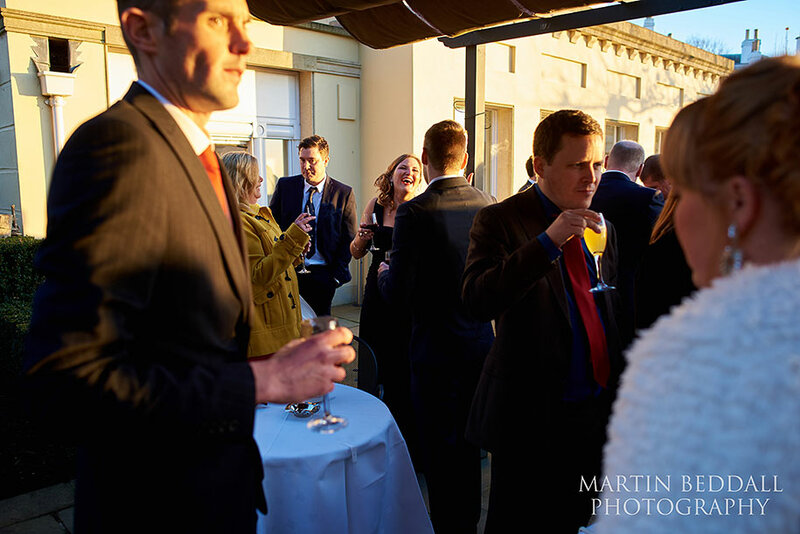 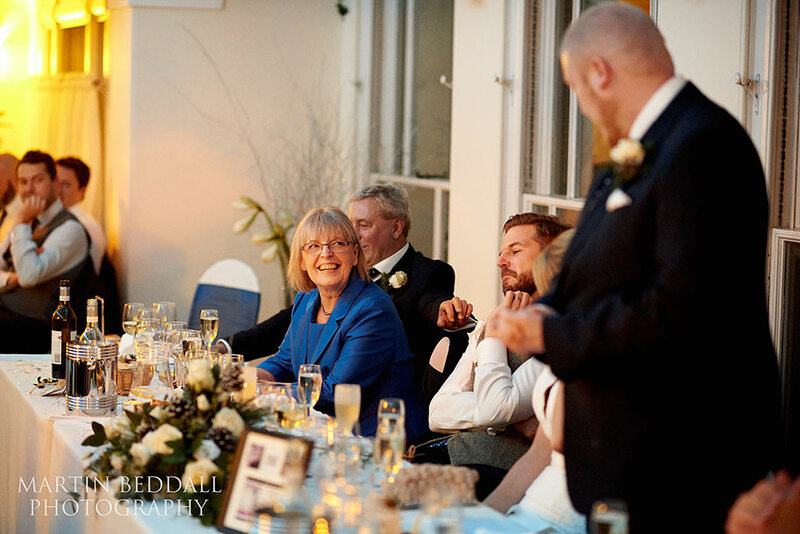 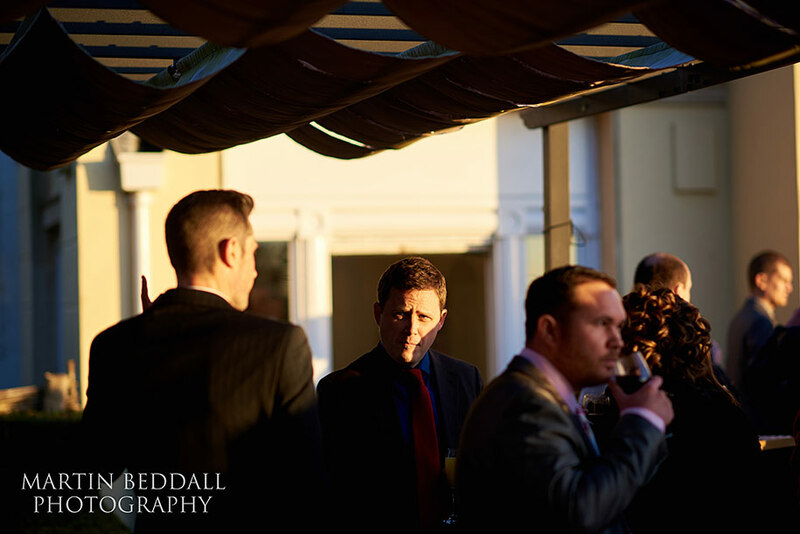 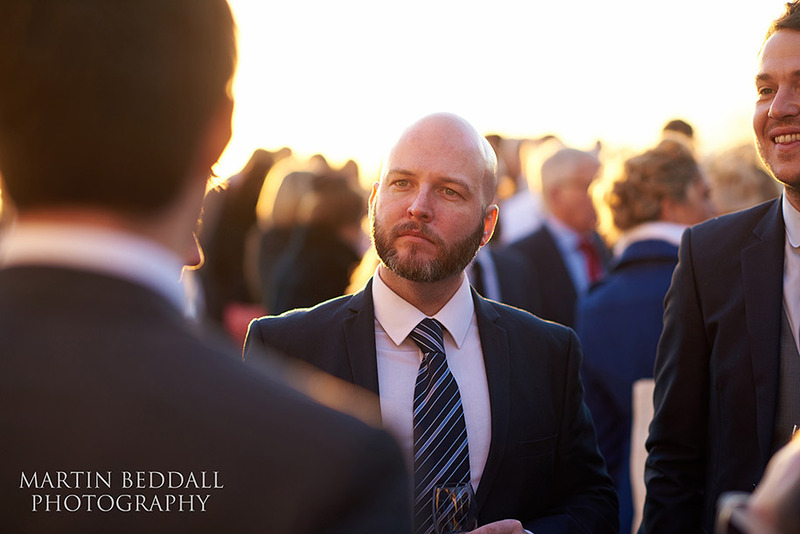 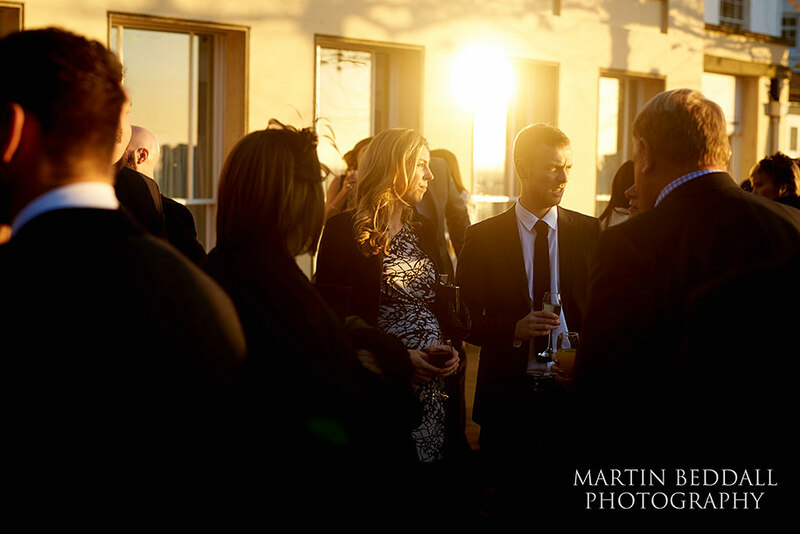 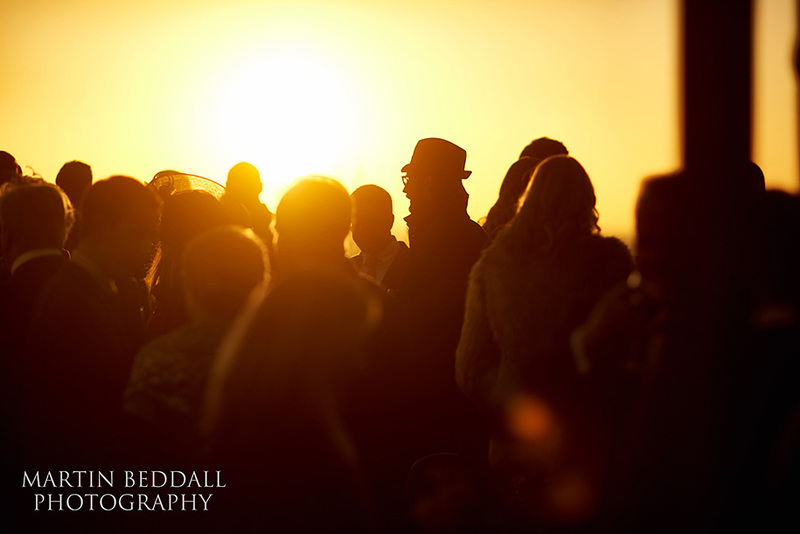 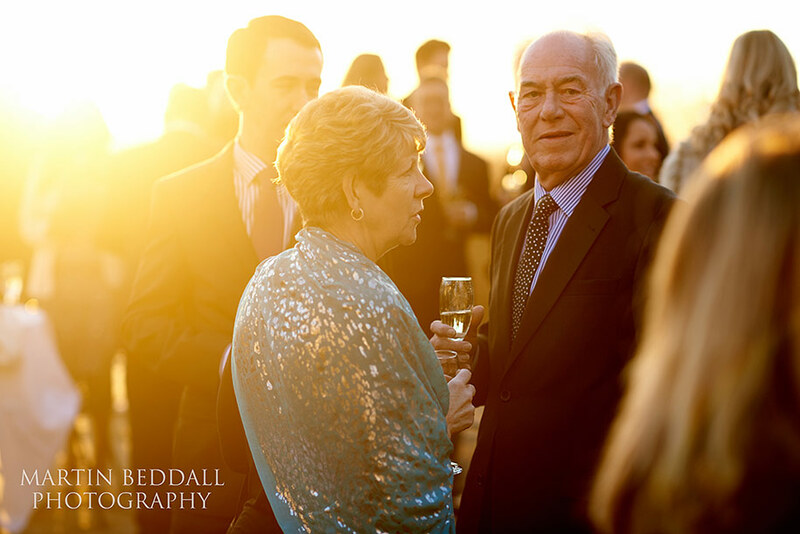 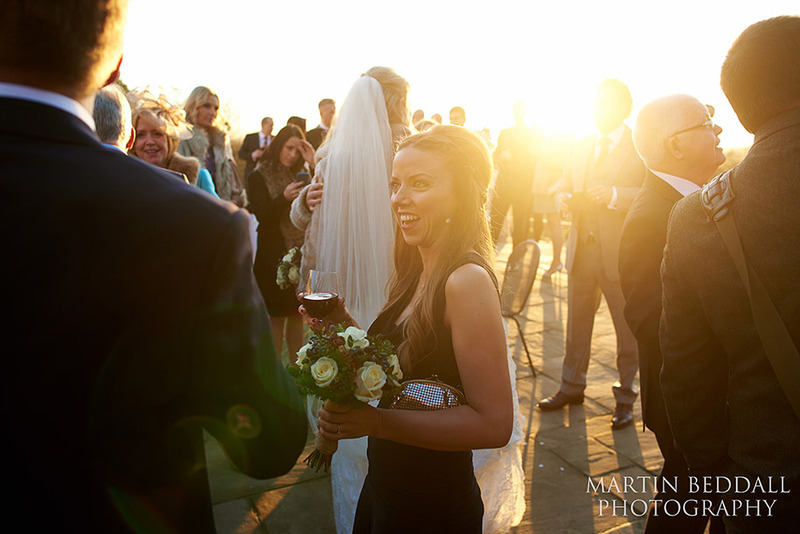 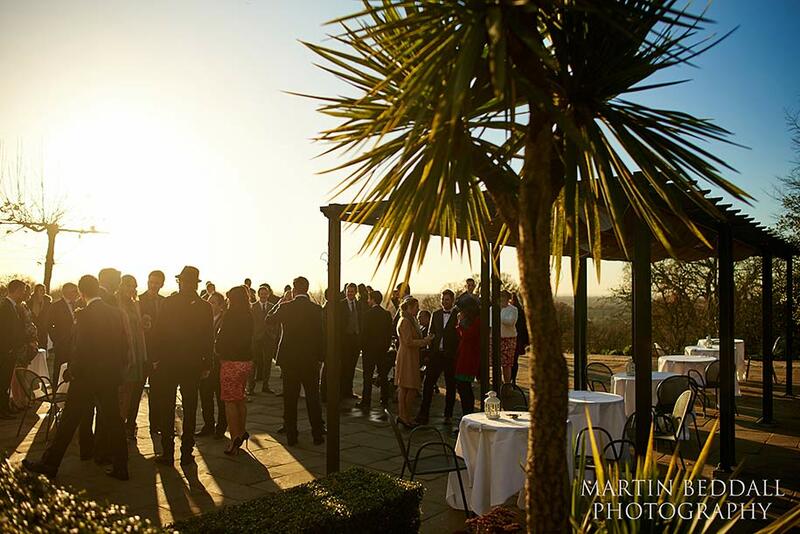 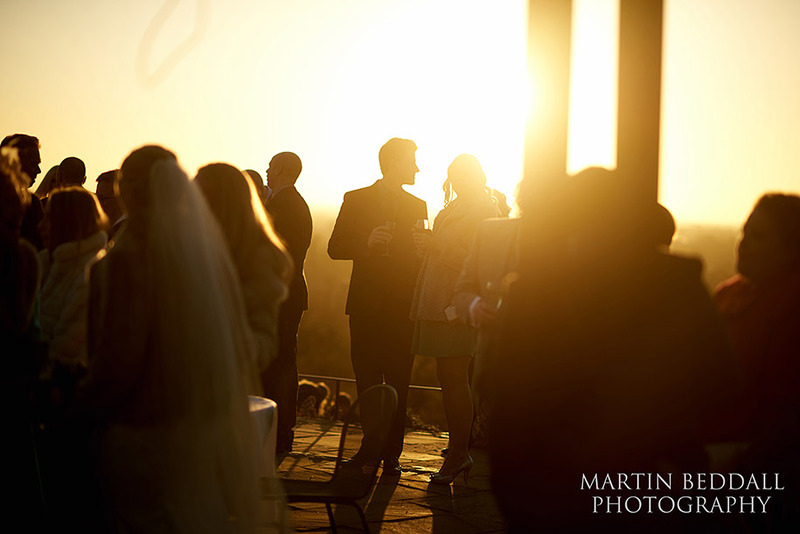 With the ceremony over, Sarah and Russell were briefly joined on the terrace in the sunshine before everyone went back inside for the meal, as the sun disappeared and the temperature plummeted. 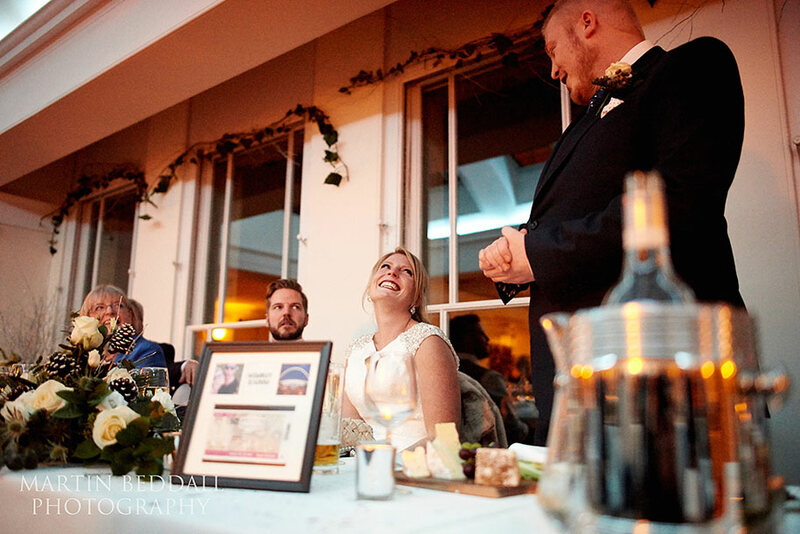 Speeches followed the food and Russell had arranged a surprise for the end of his speech. 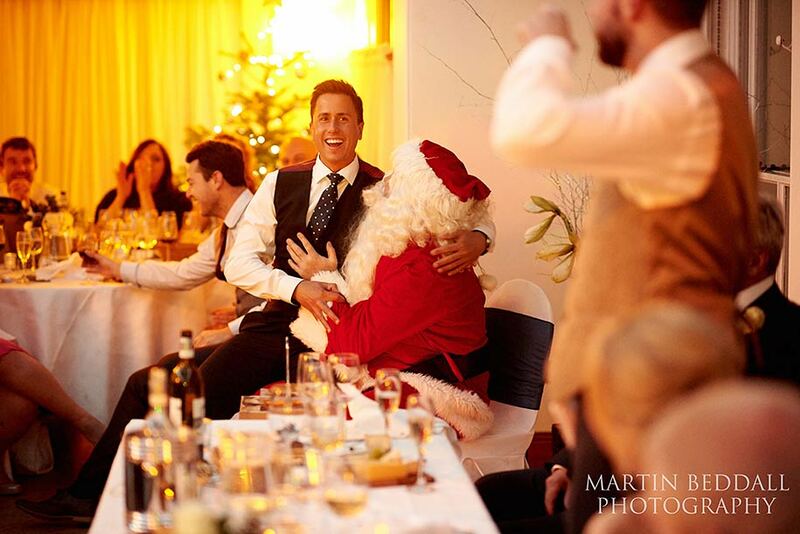 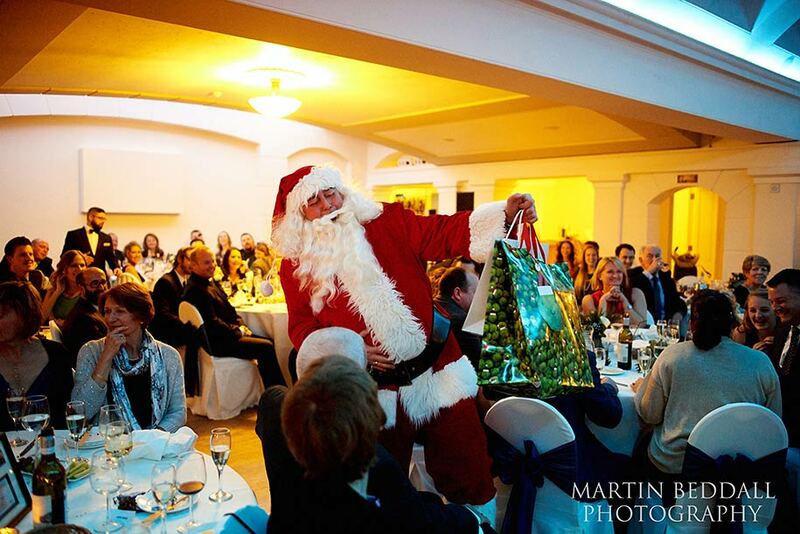 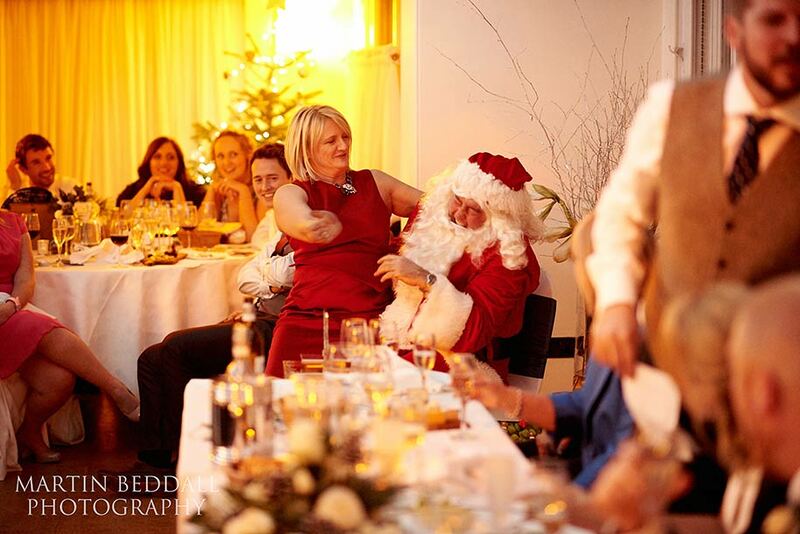 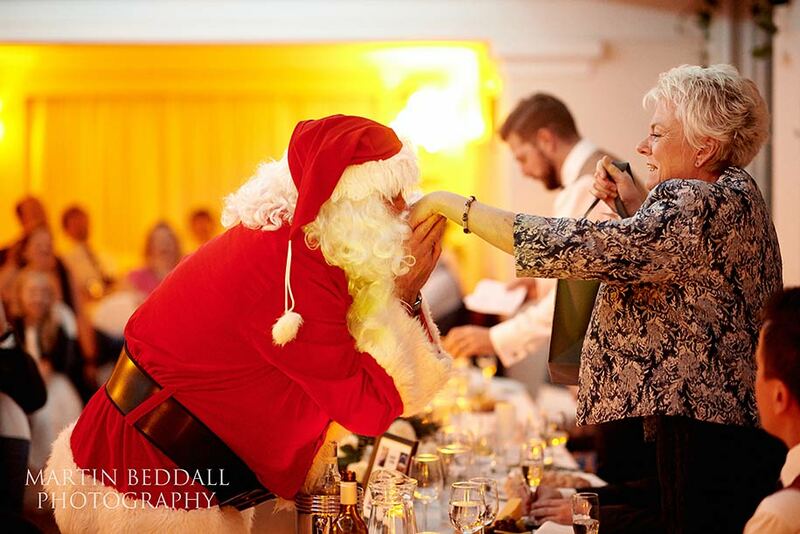 A seasonal visitor to hand out the gifts – a ‘bad Santa’. 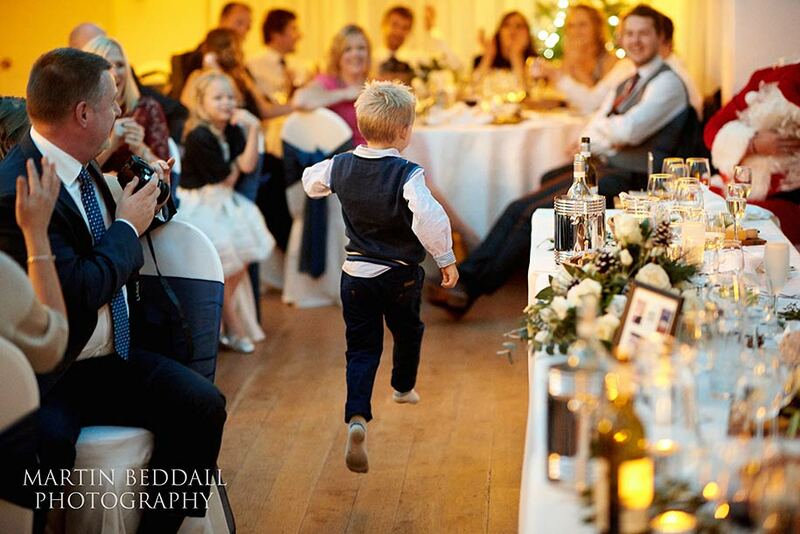 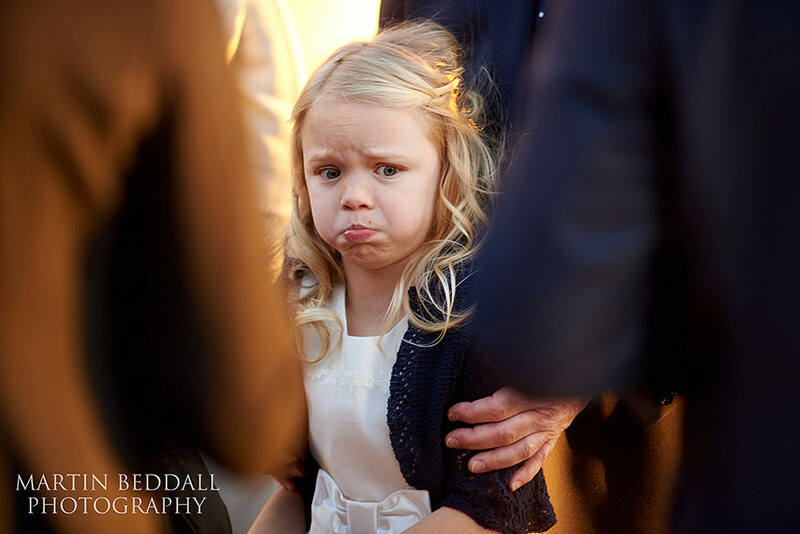 He got a slap from cousin Ruth, a best man sat on his knee and from one little boy, a leap of excitement. 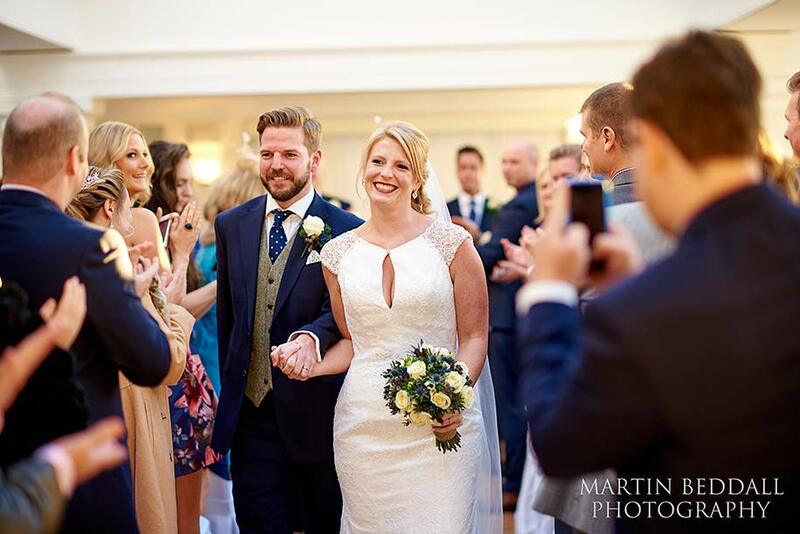 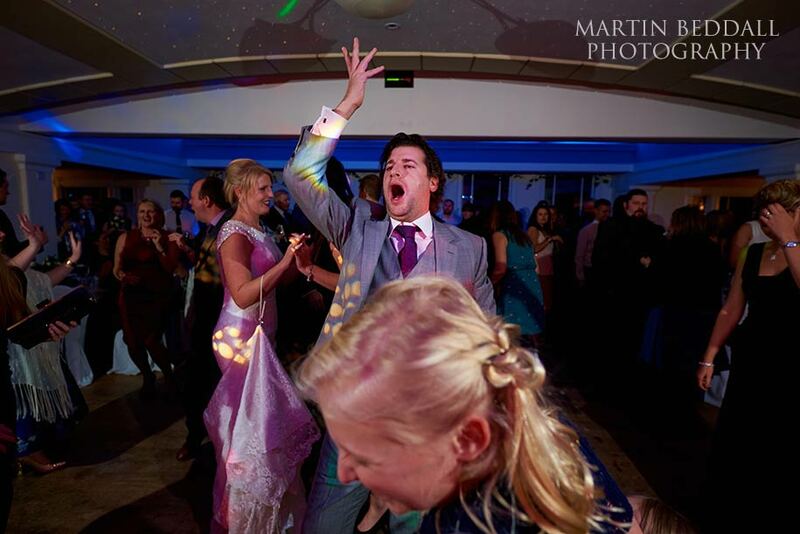 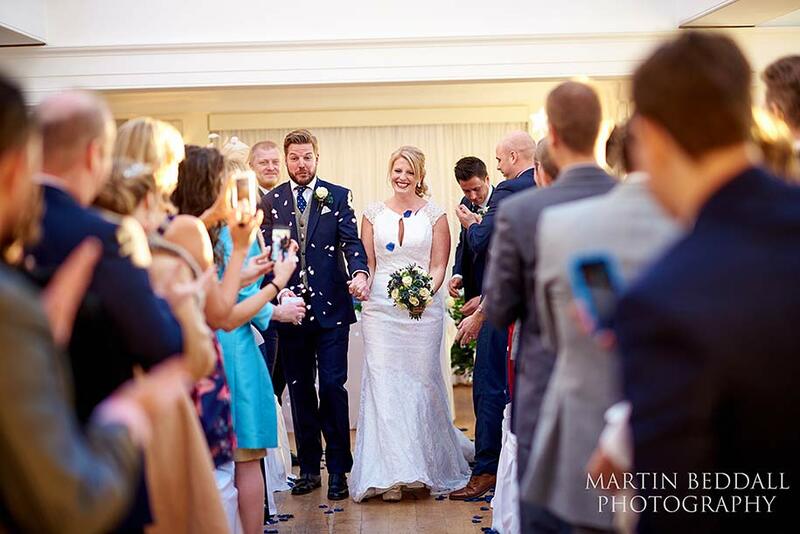 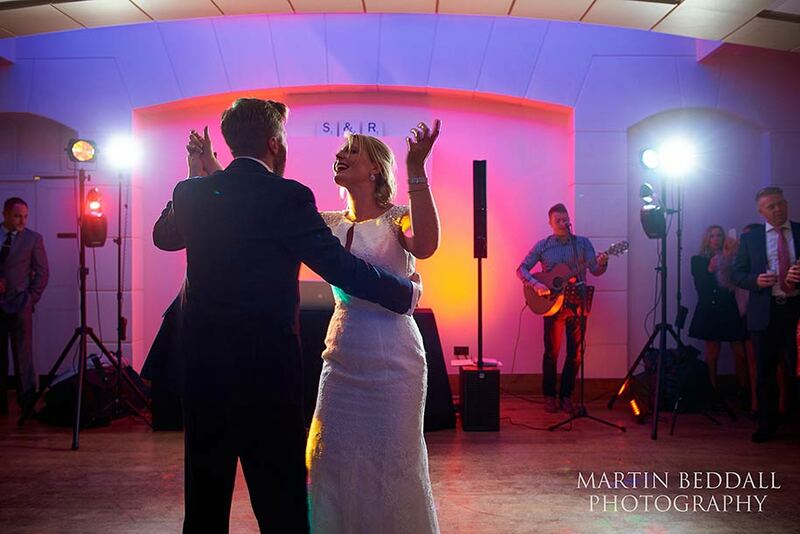 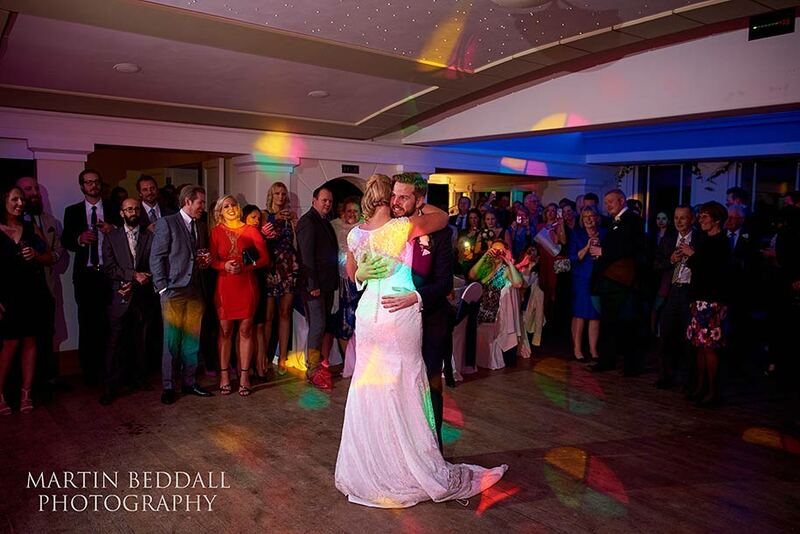 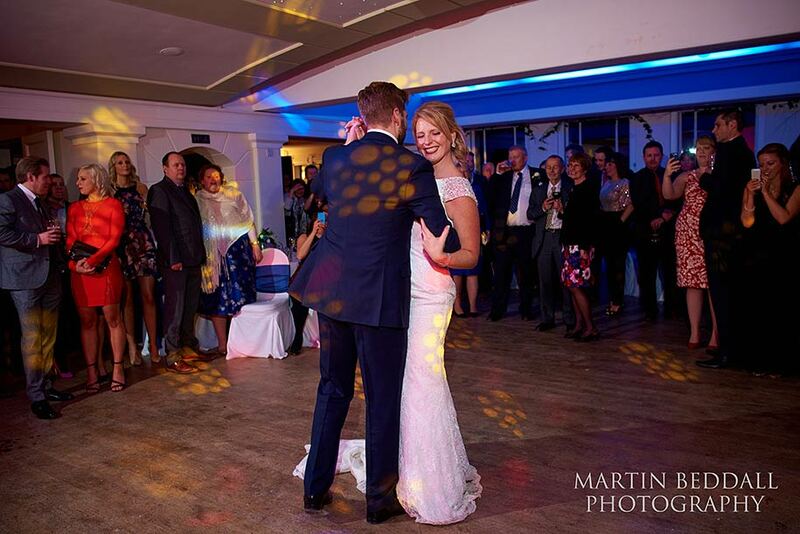 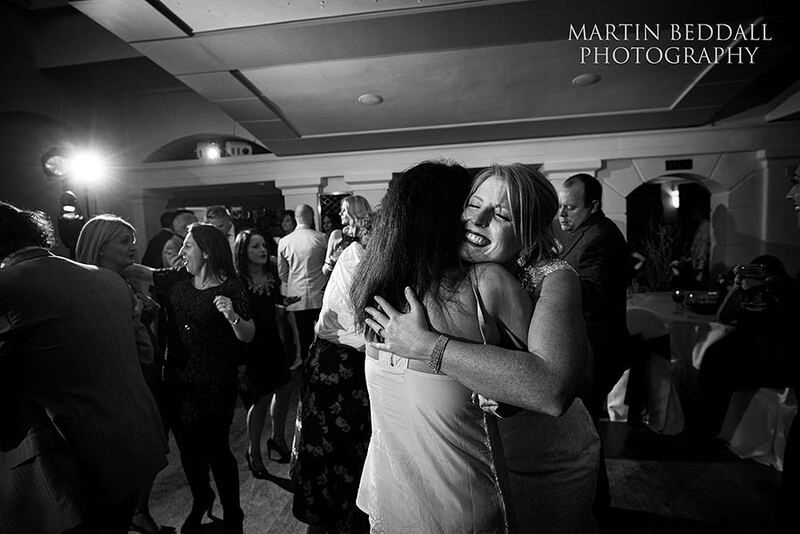 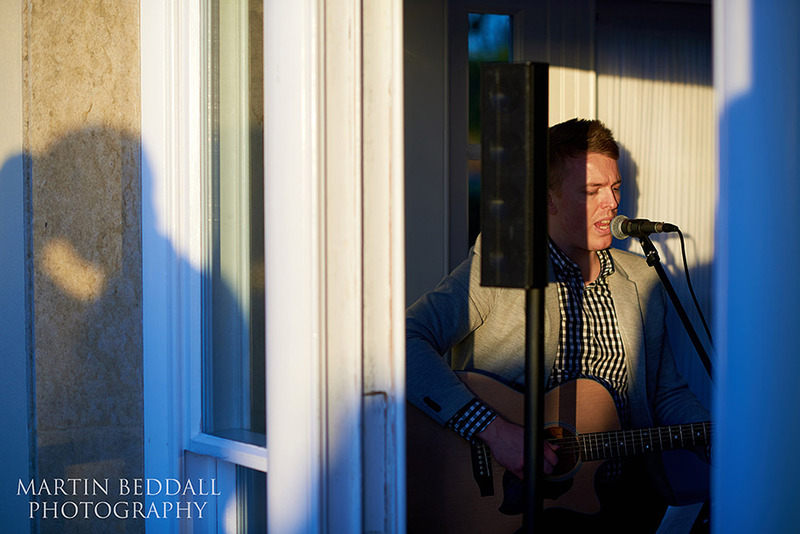 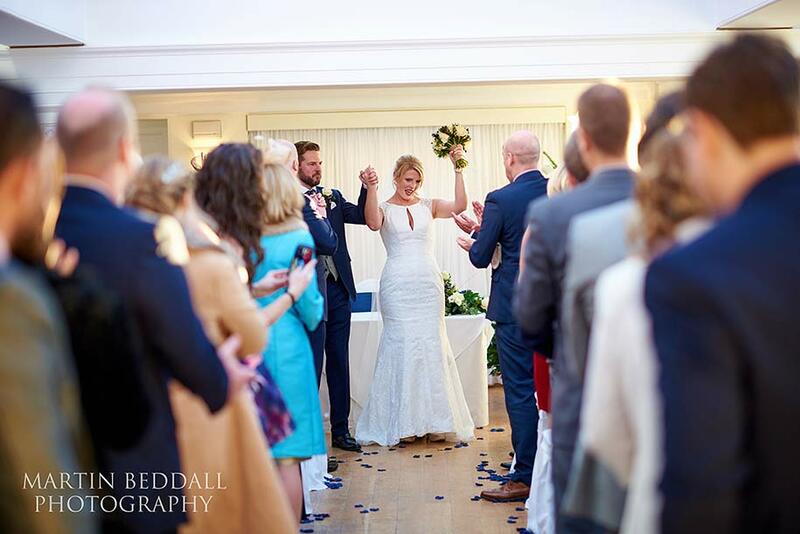 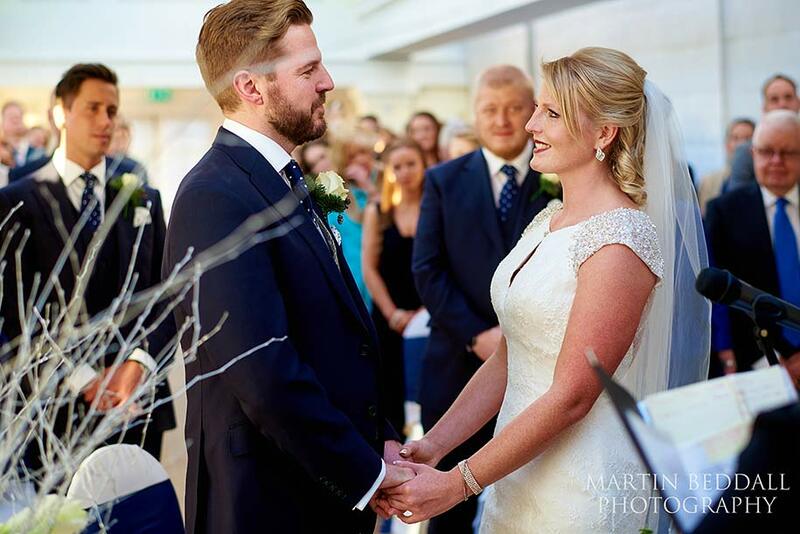 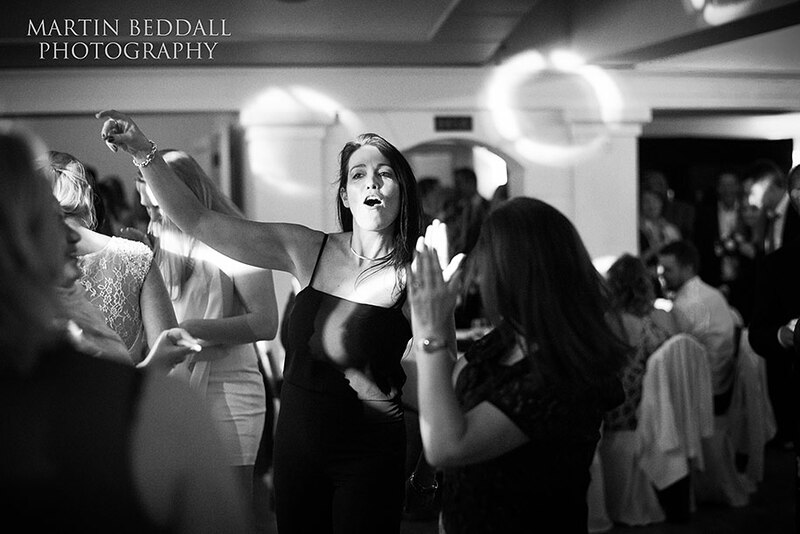 For the dancing to follow, George Simpson ( Winner, best musical act, East Midlands, The Wedding Industry Awards 2015 ) added to his guitar renditions throughout the day and became the DJ. 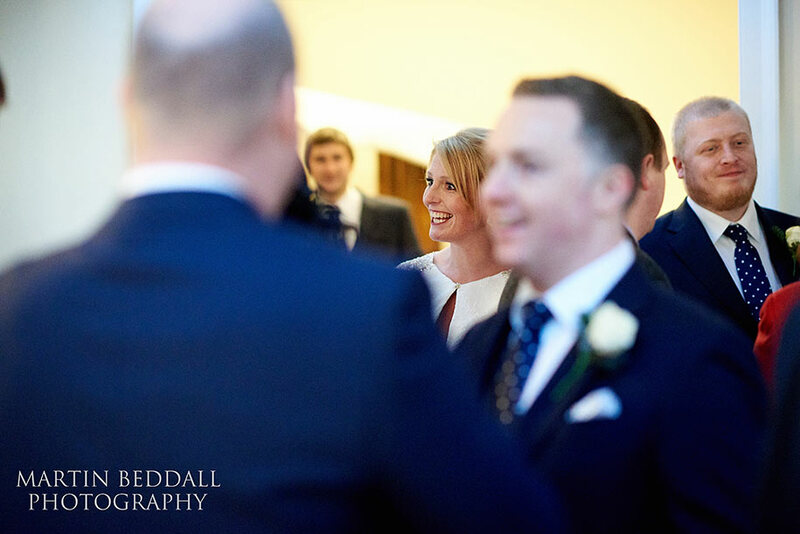 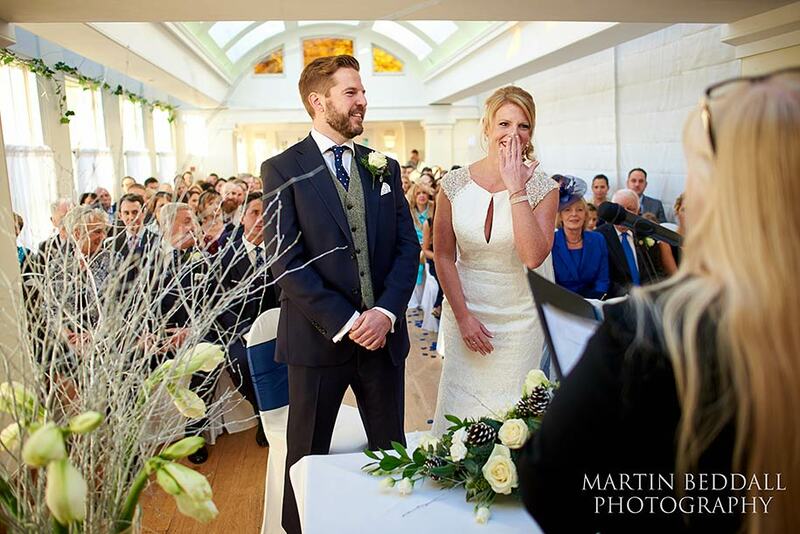 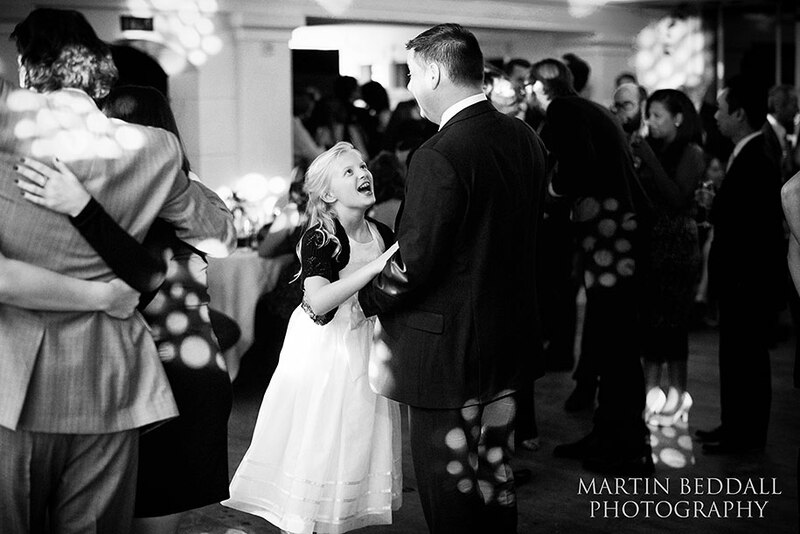 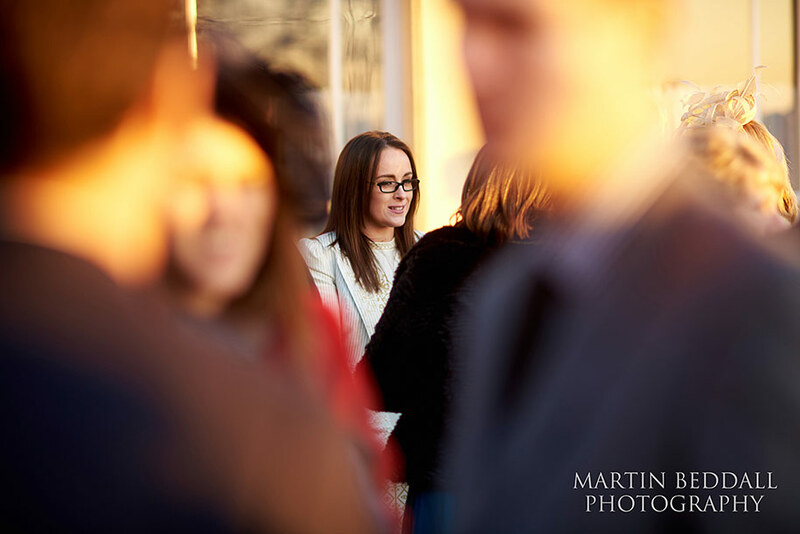 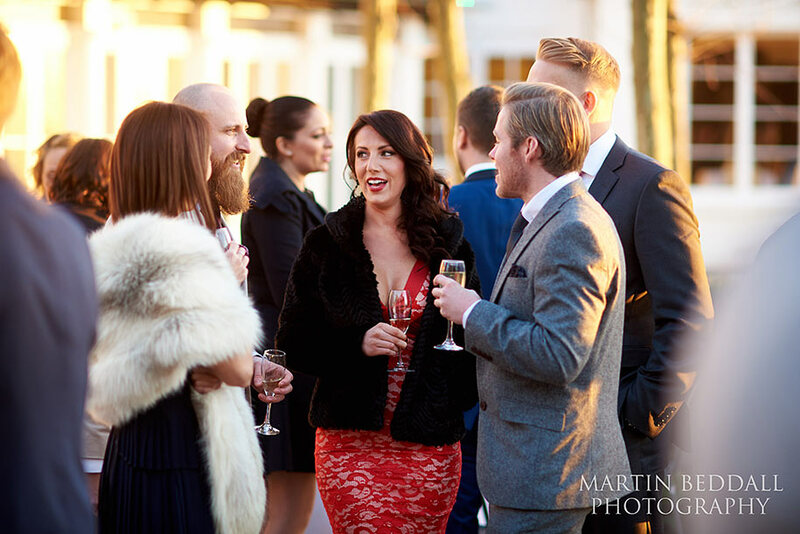 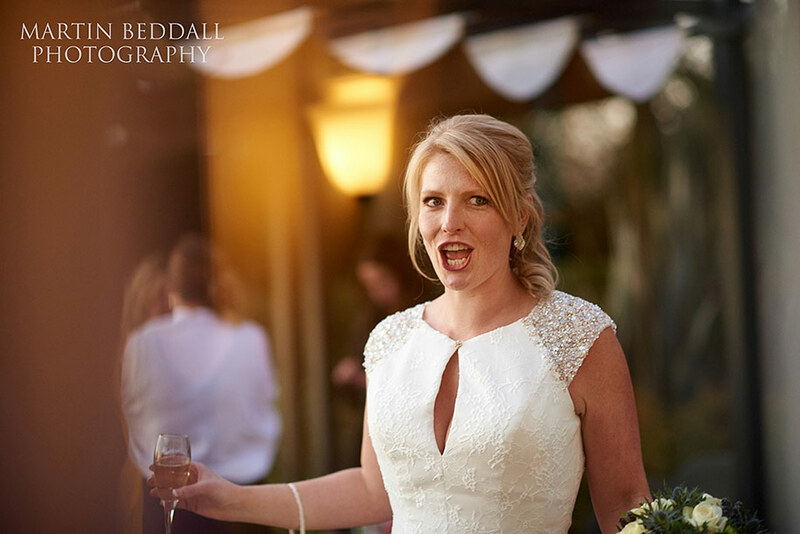 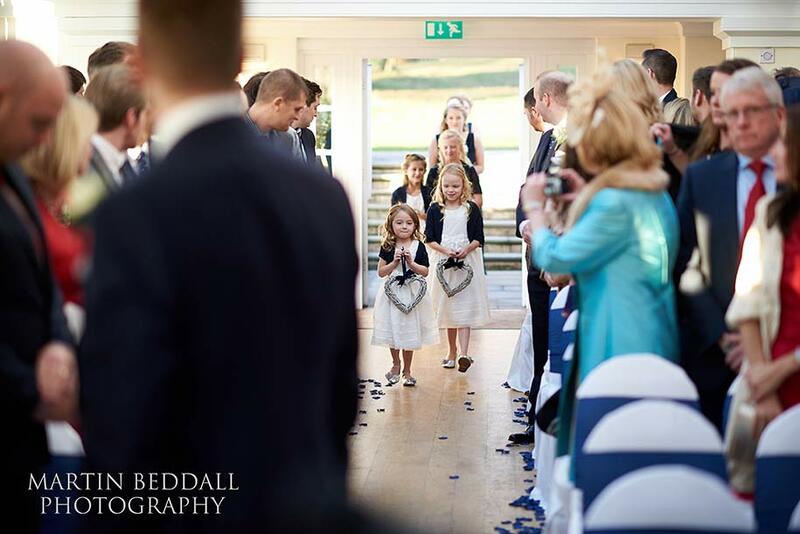 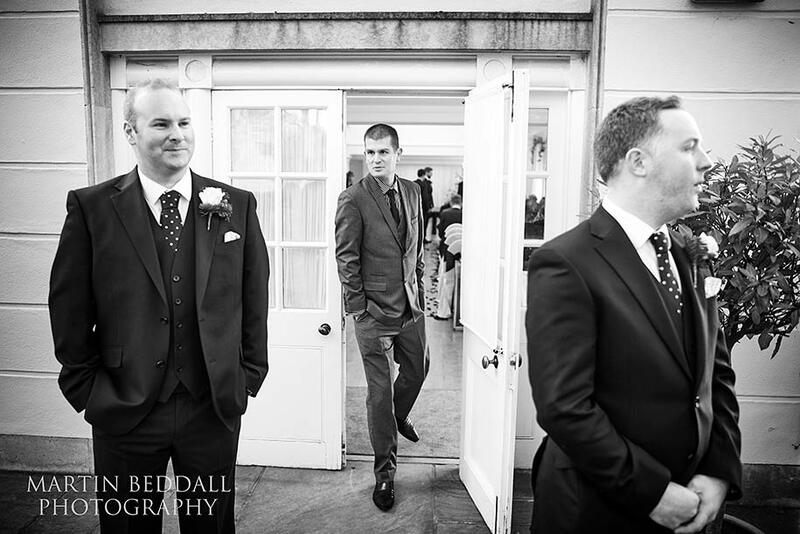 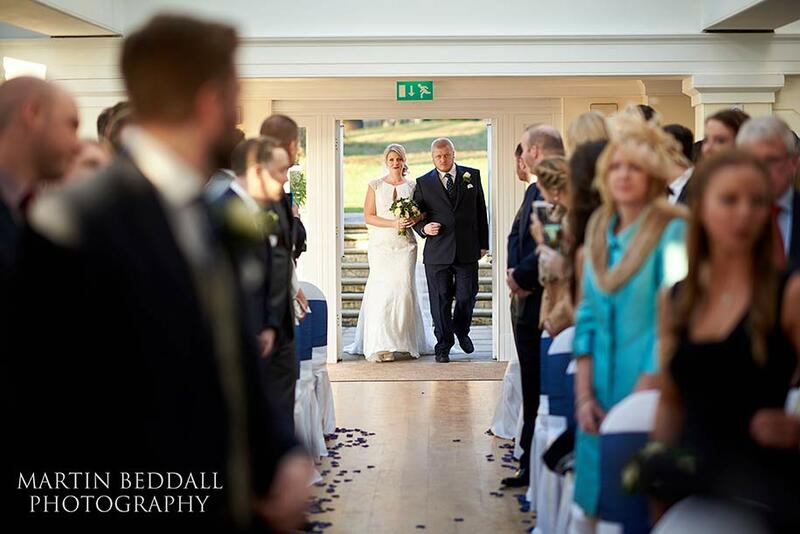 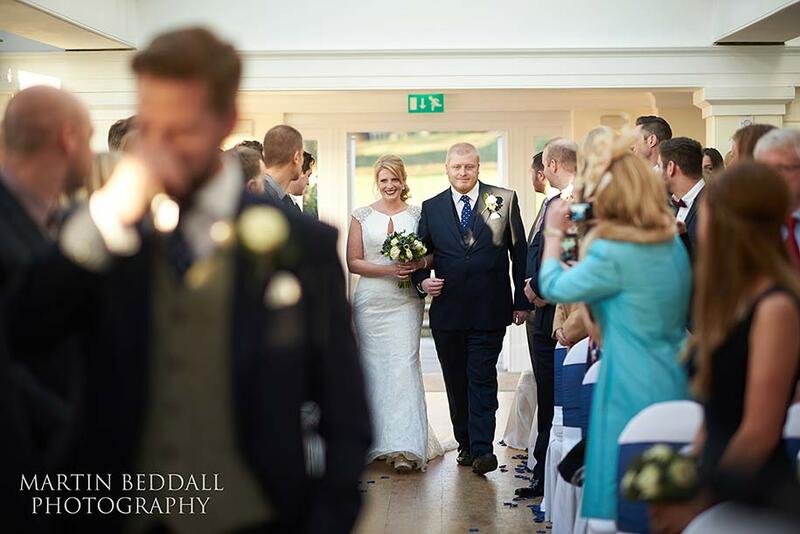 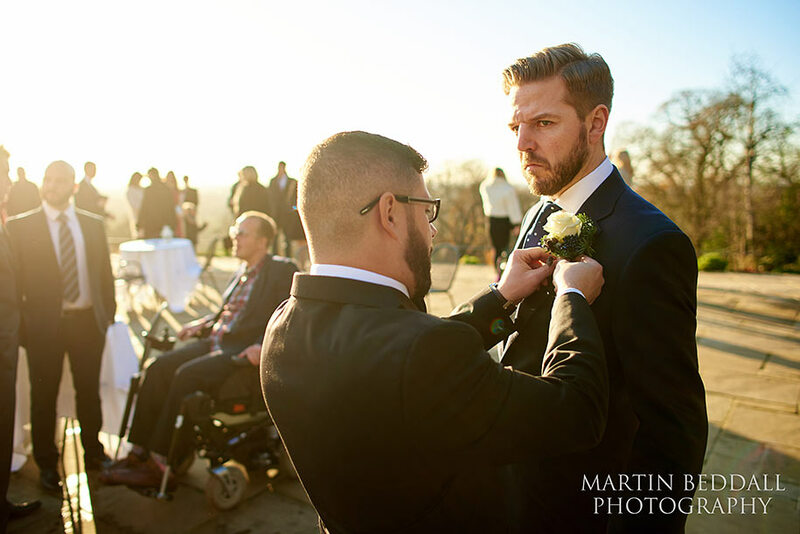 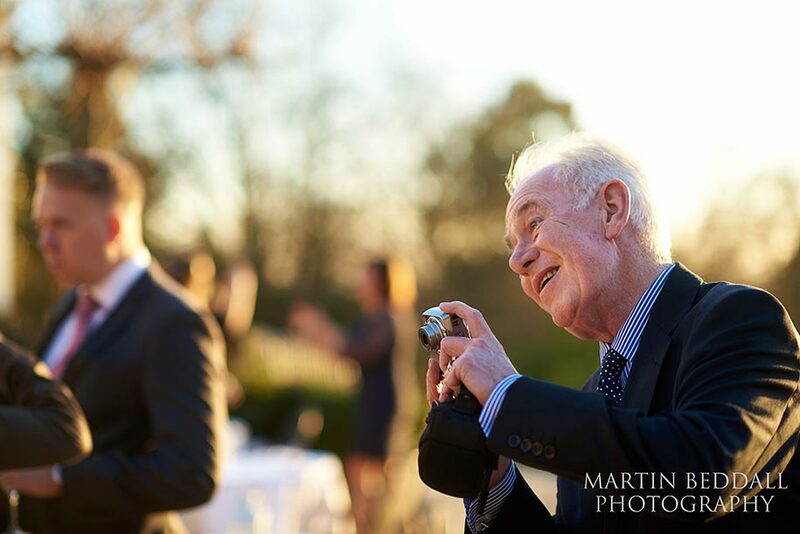 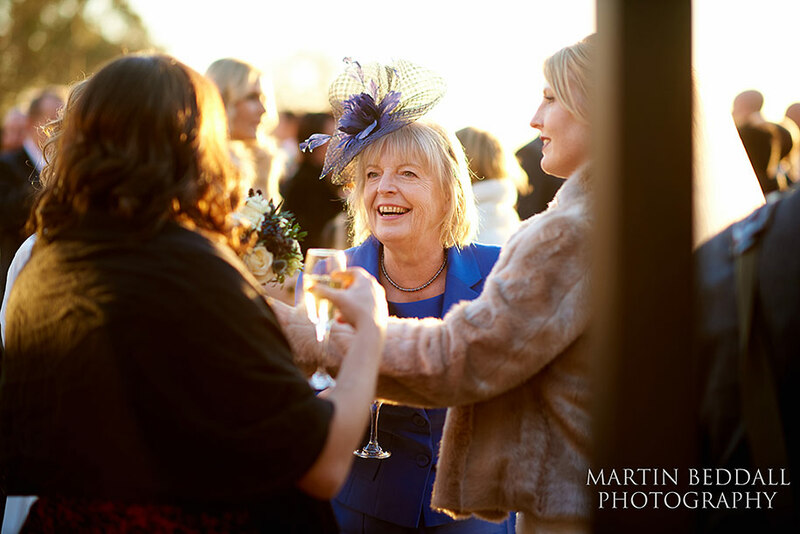 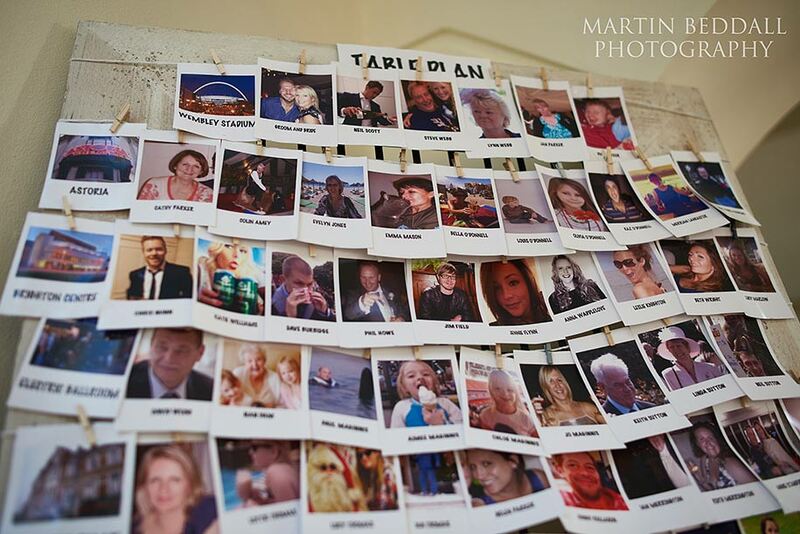 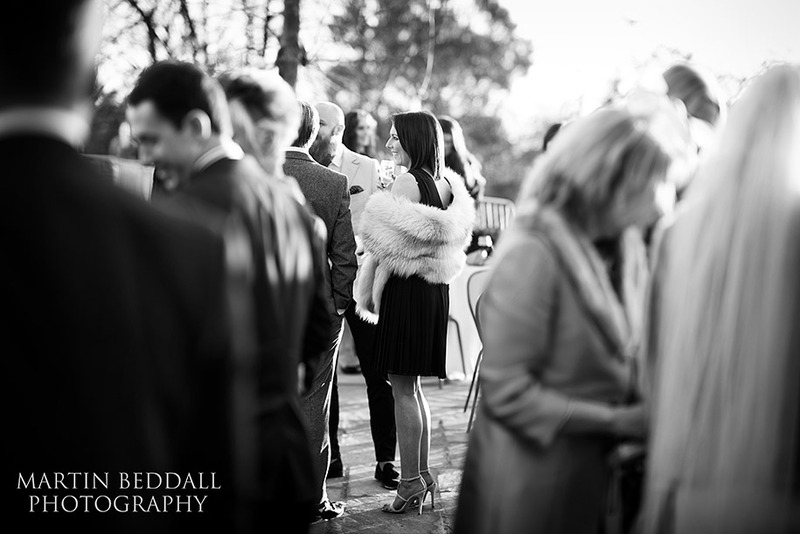 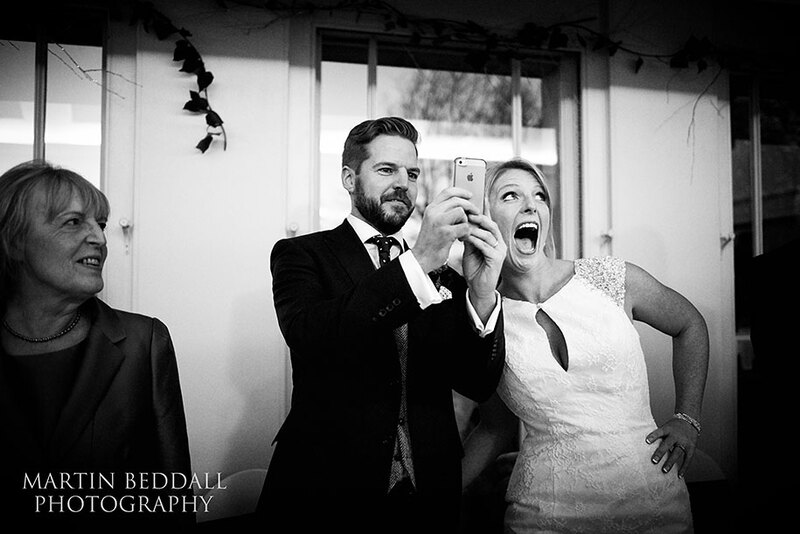 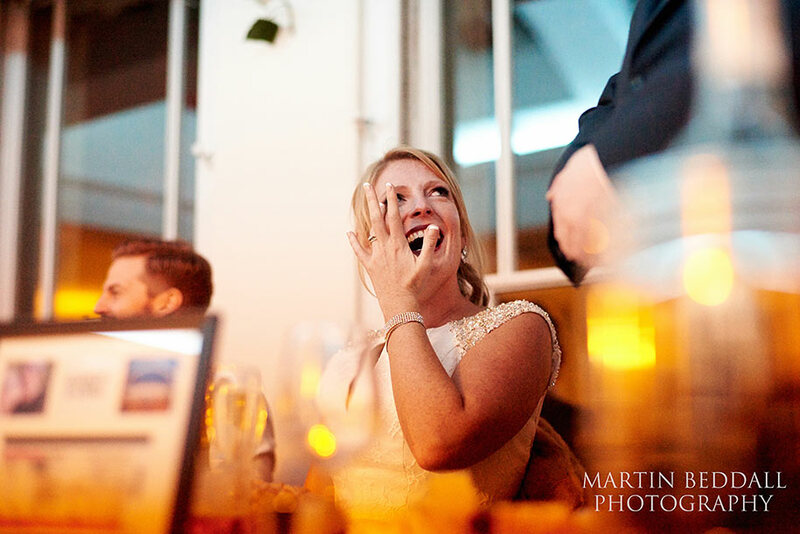 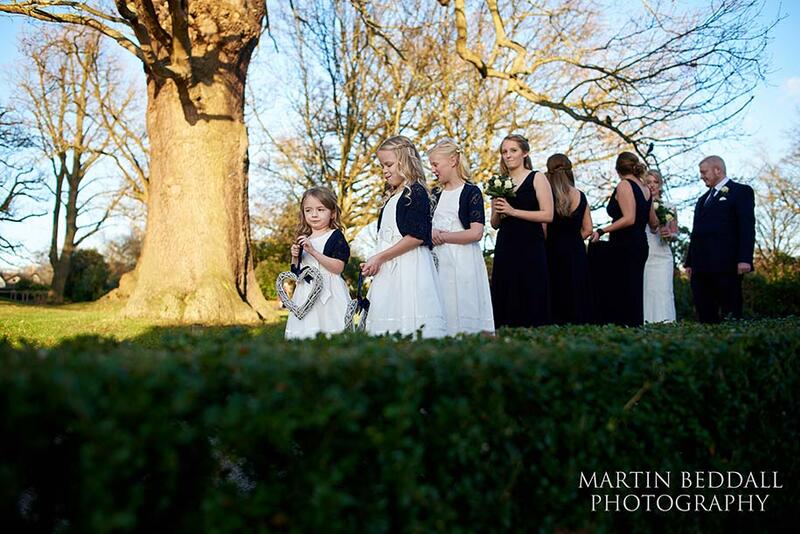 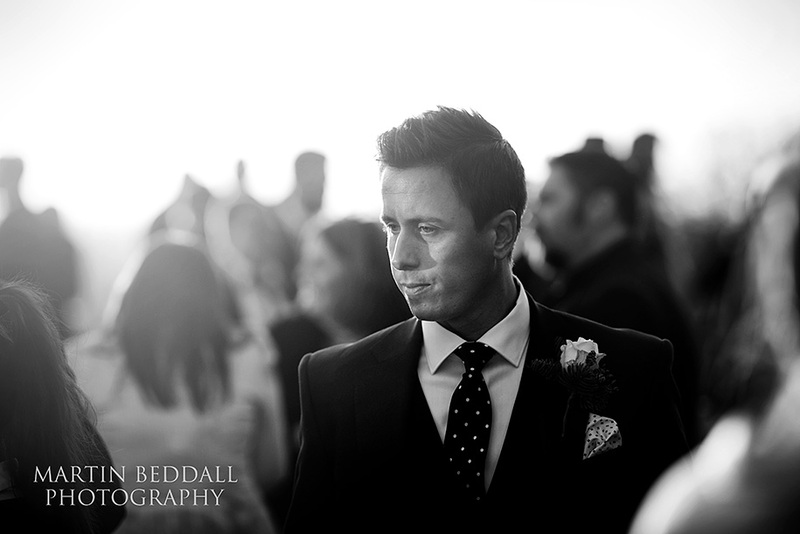 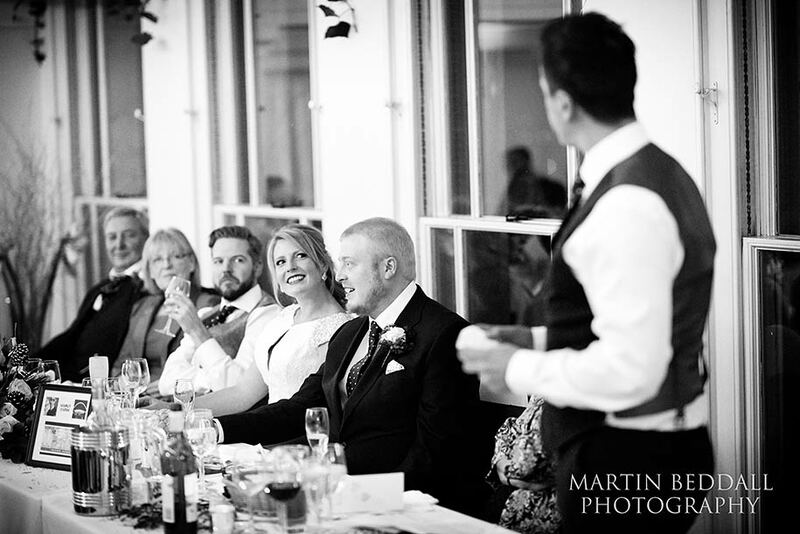 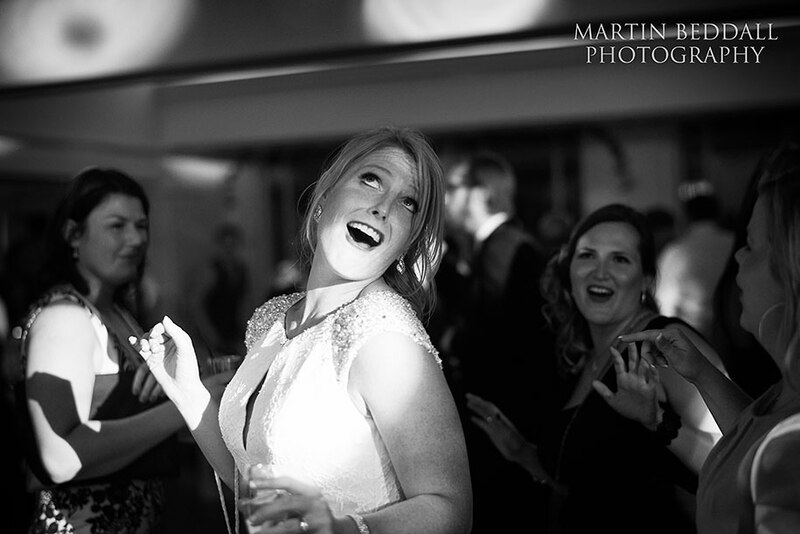 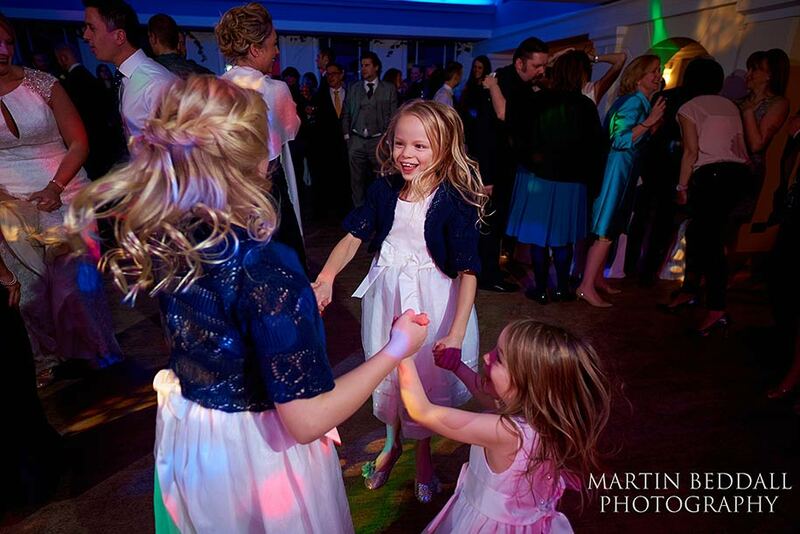 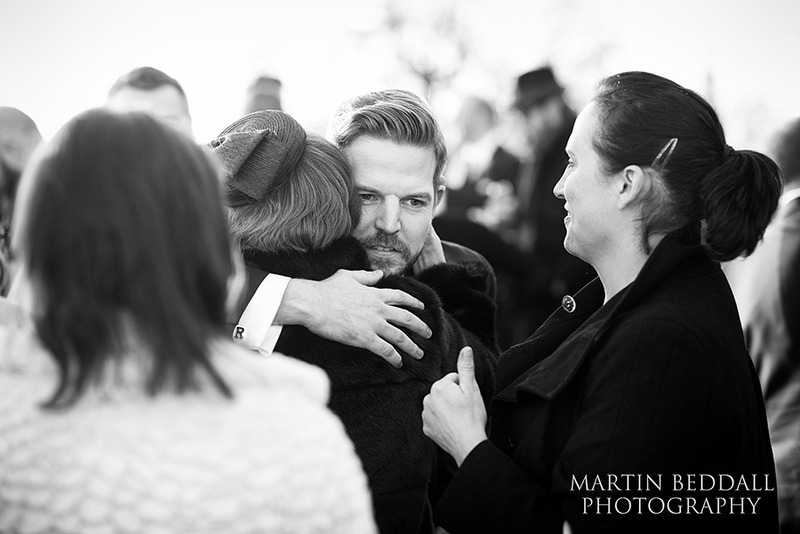 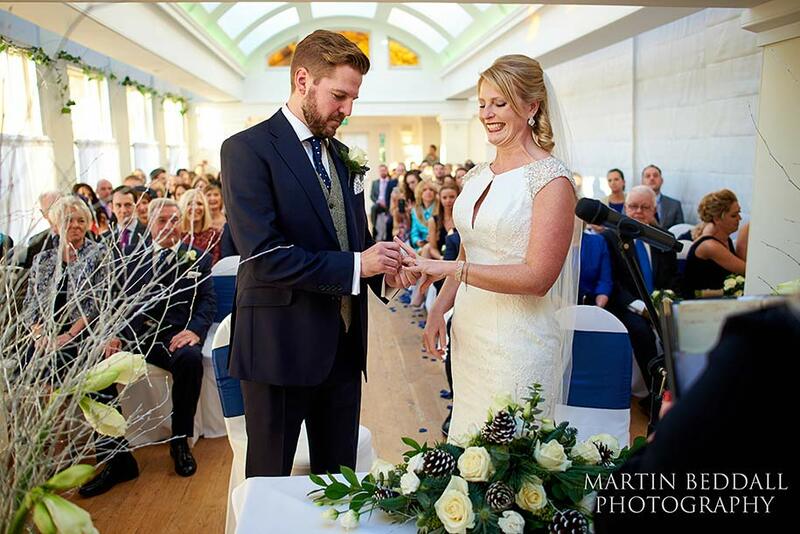 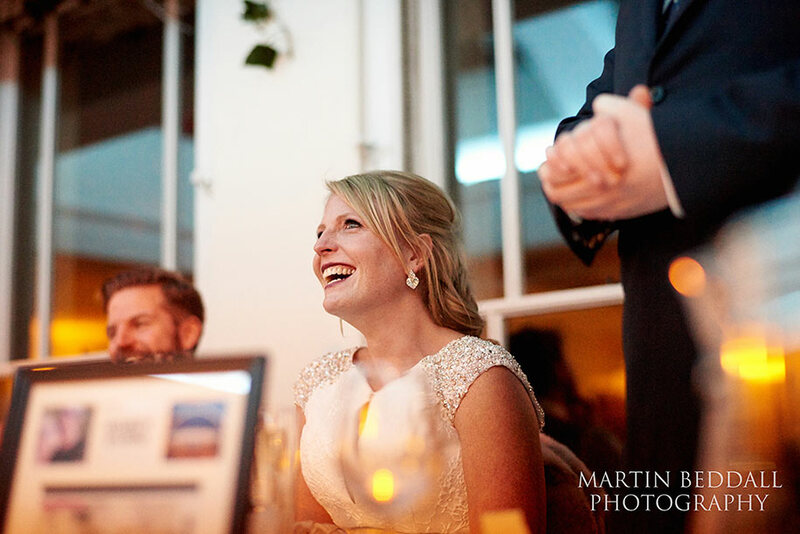 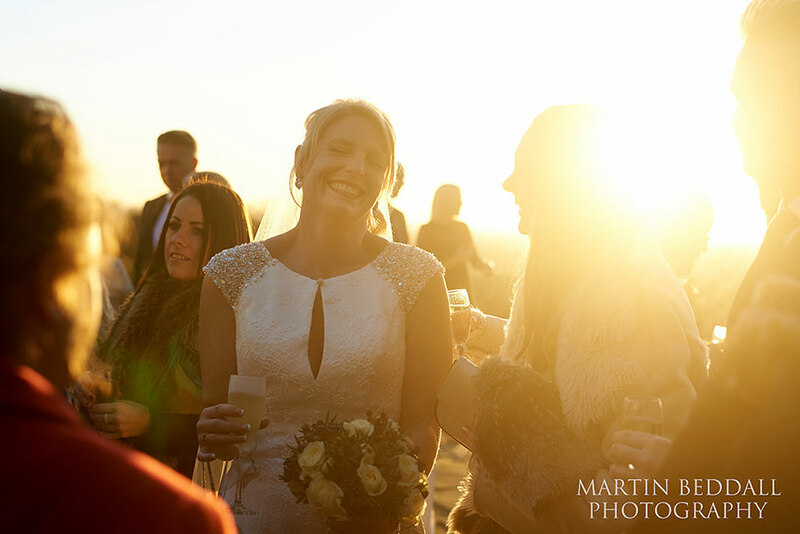 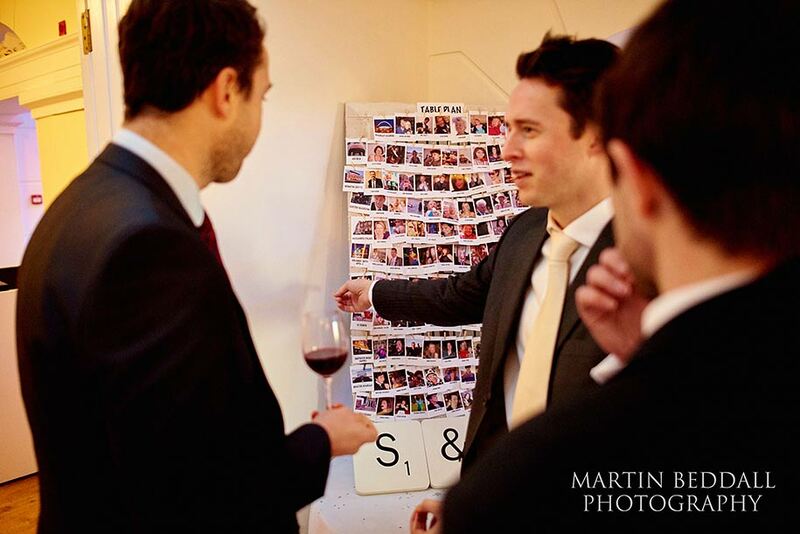 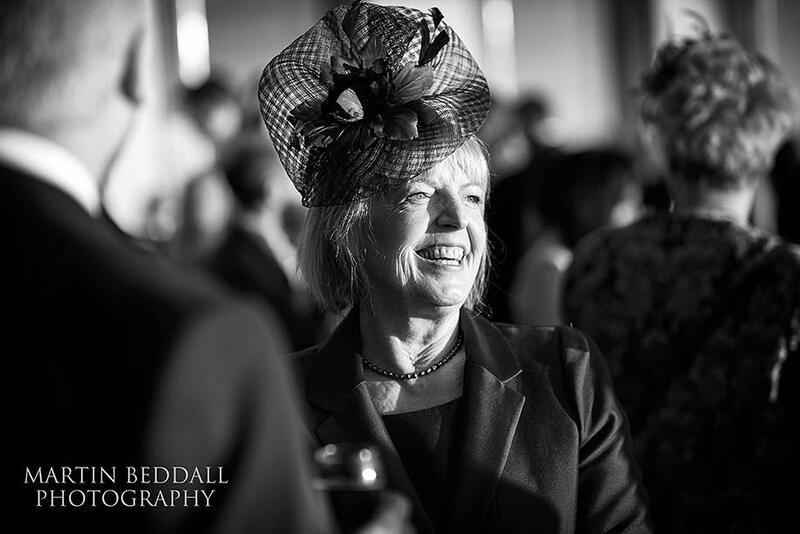 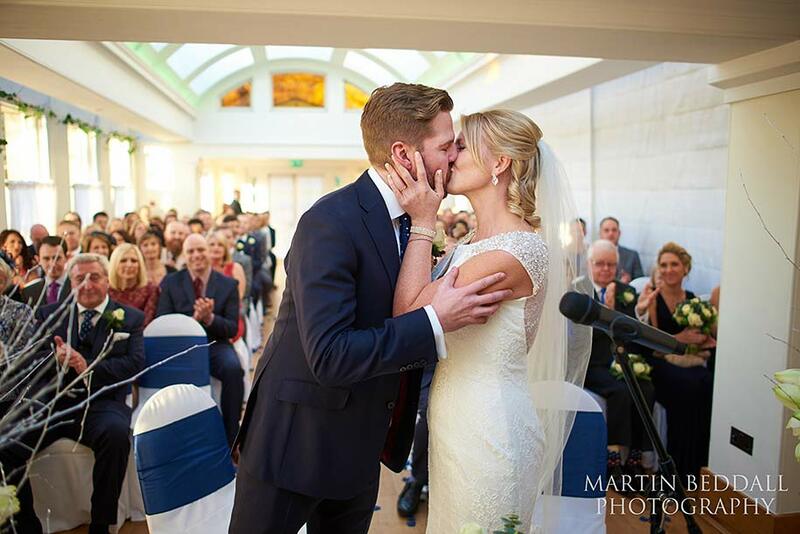 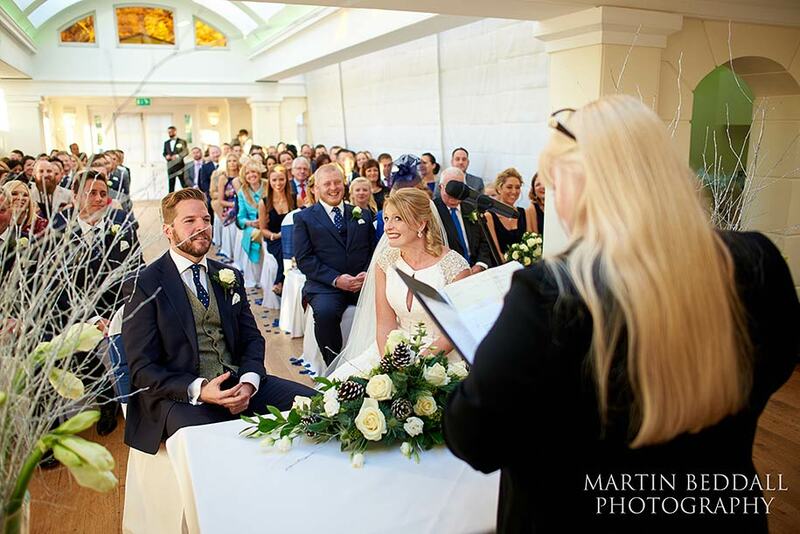 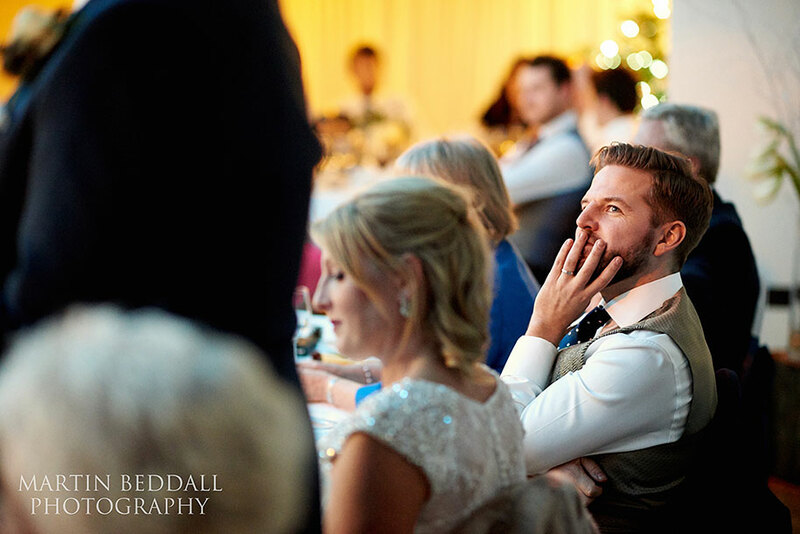 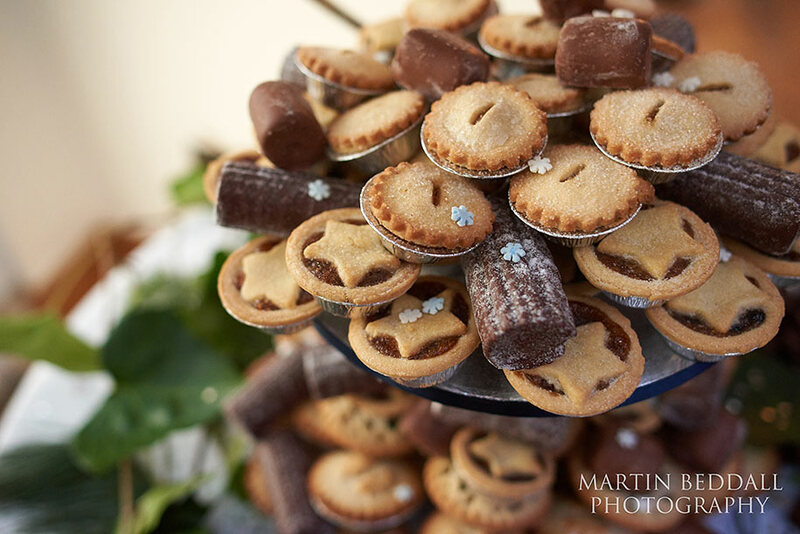 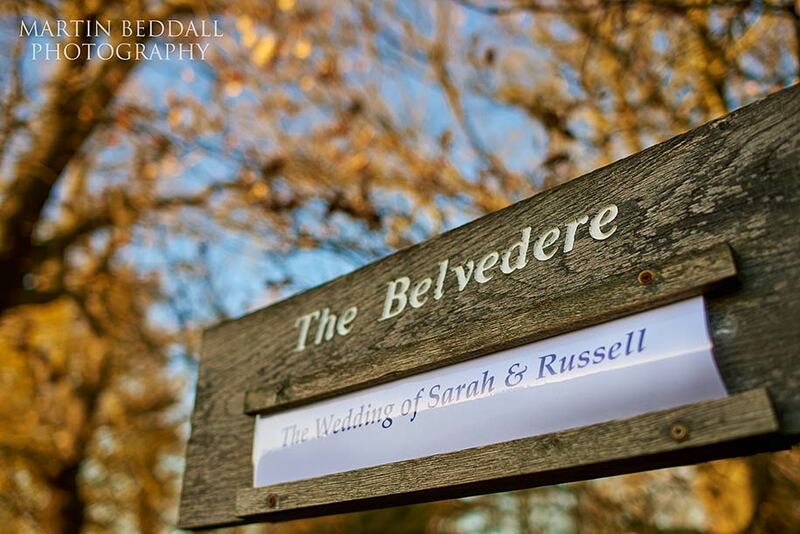 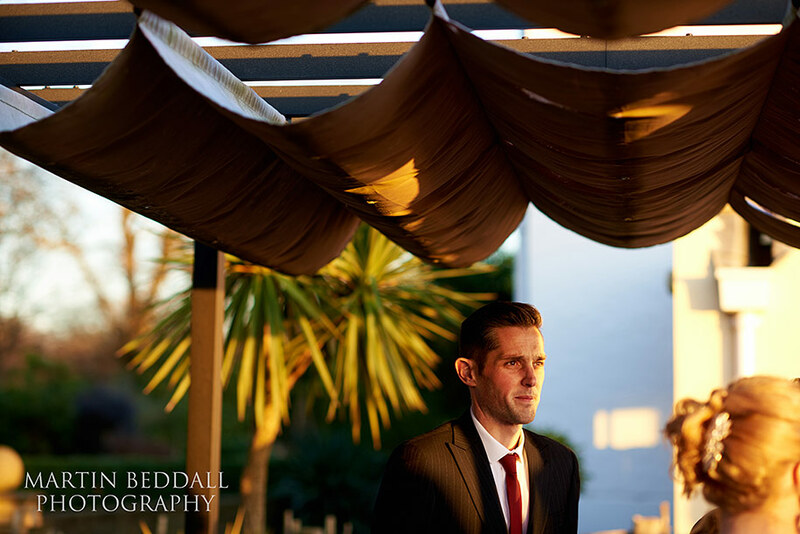 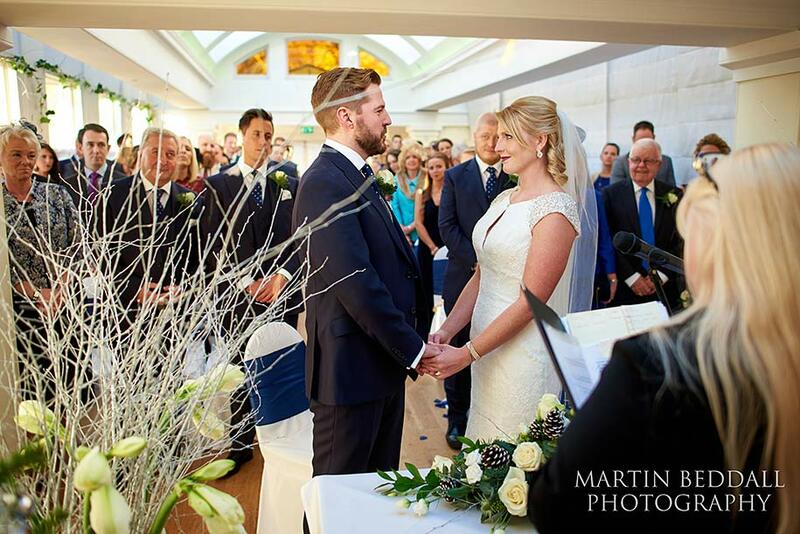 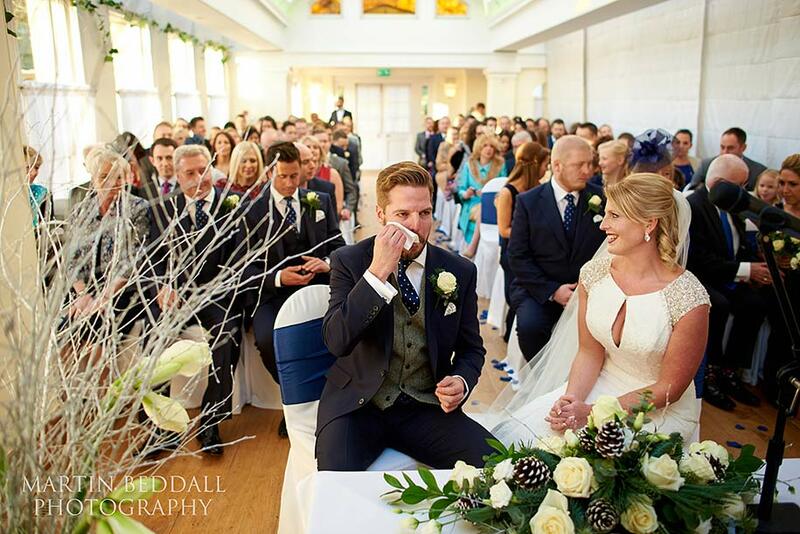 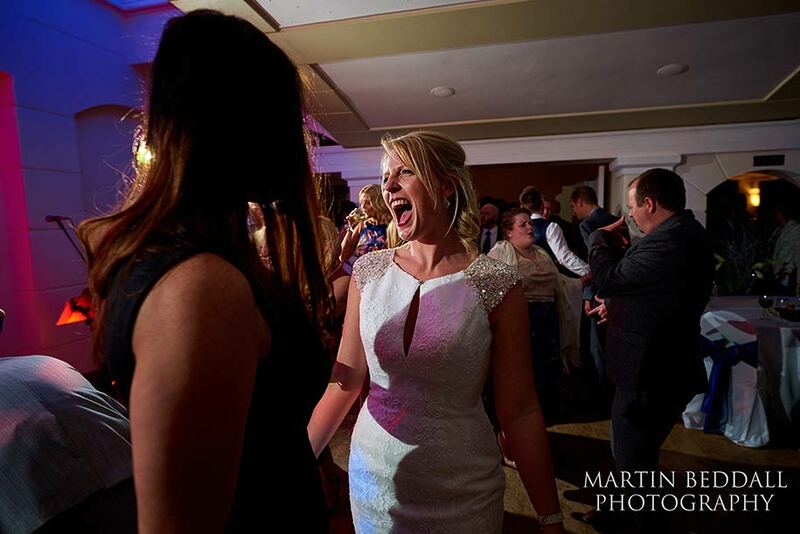 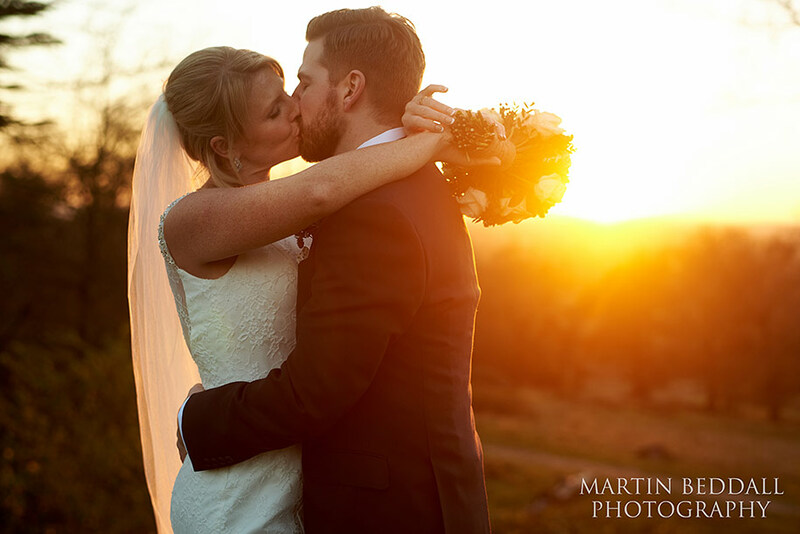 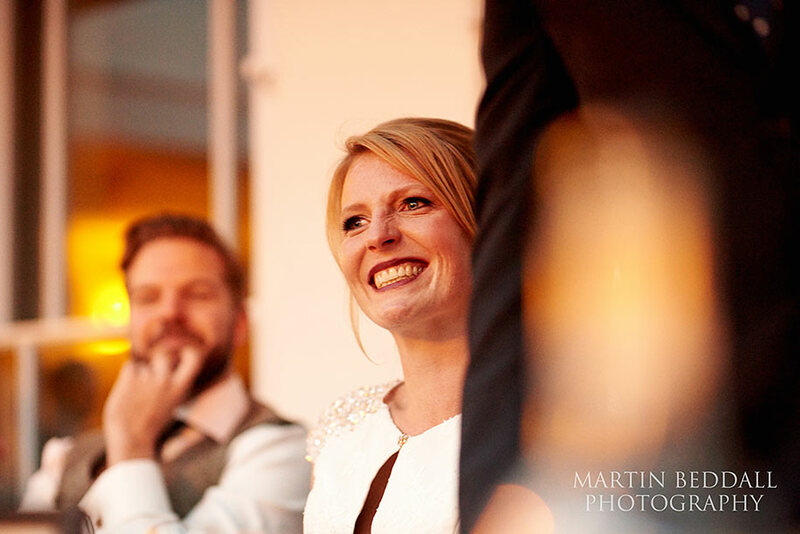 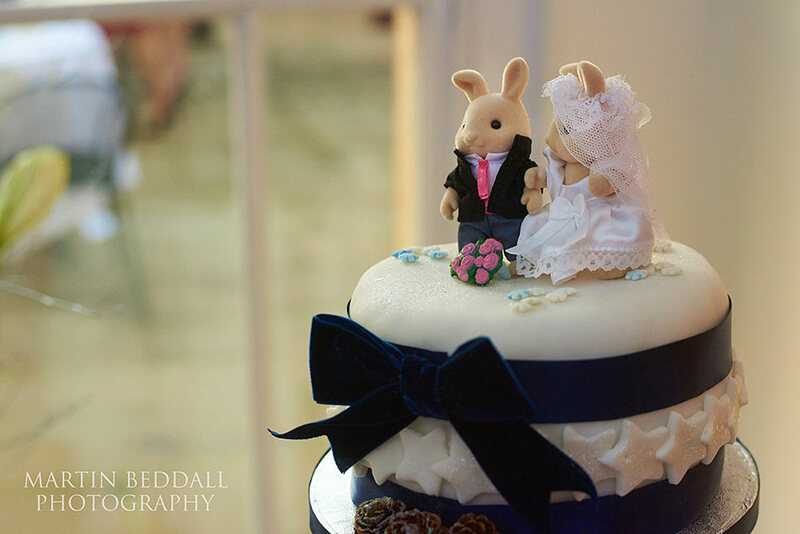 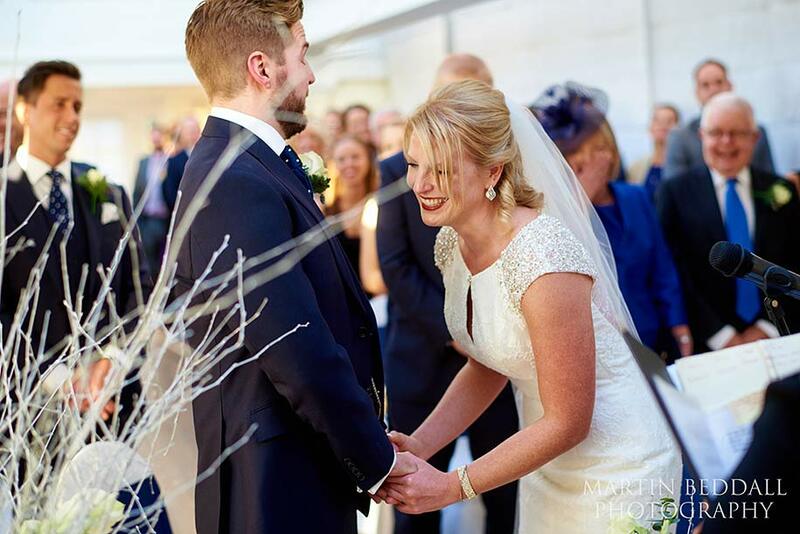 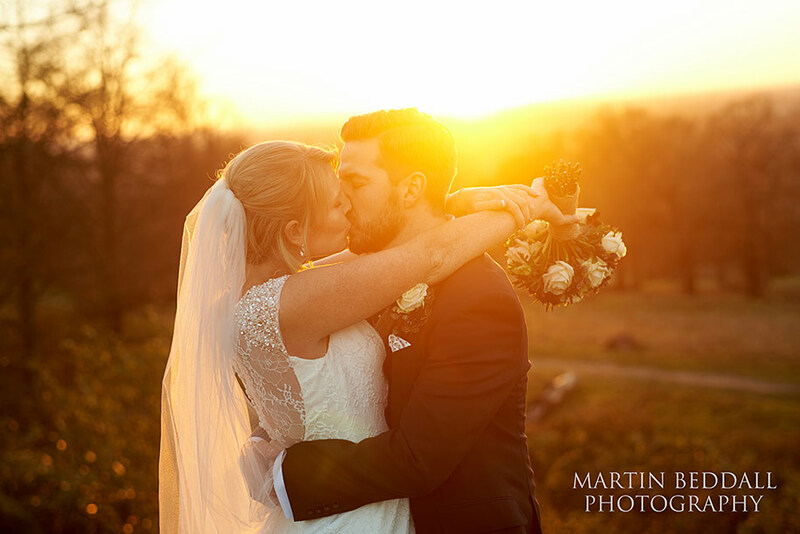 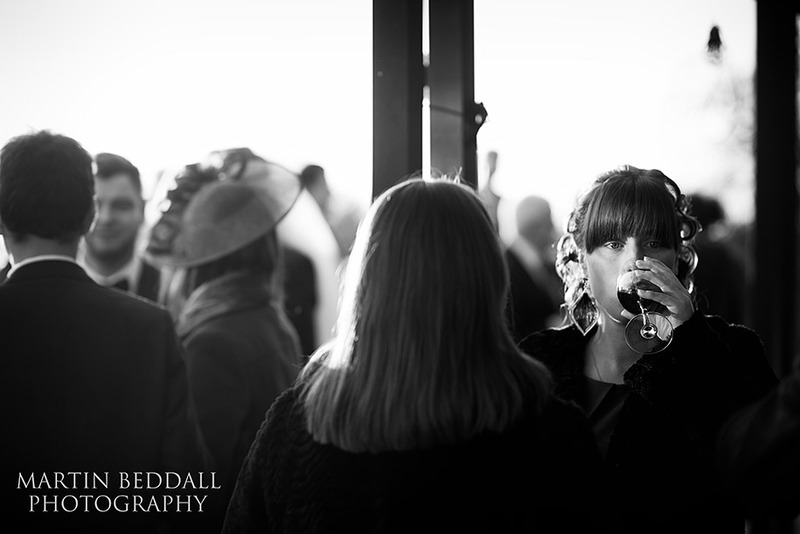 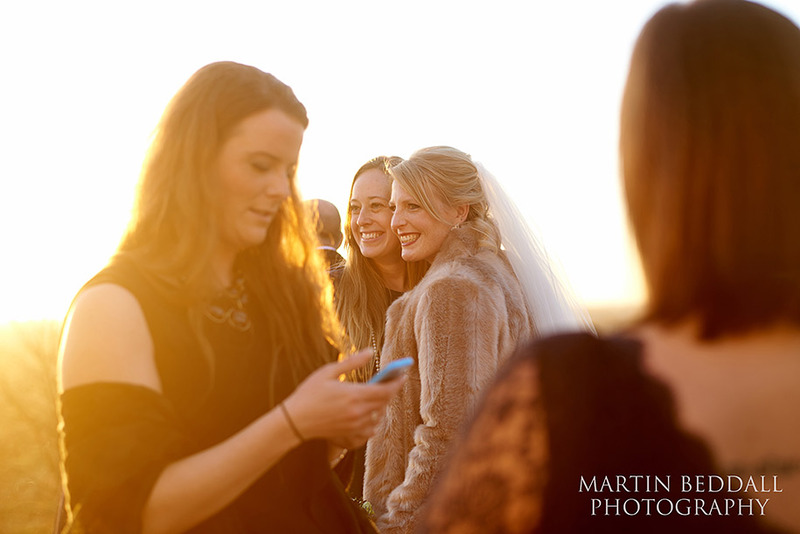 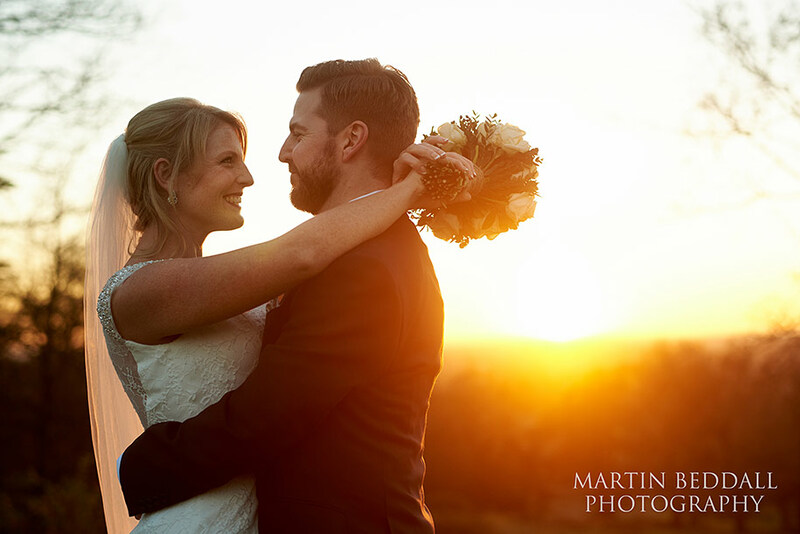 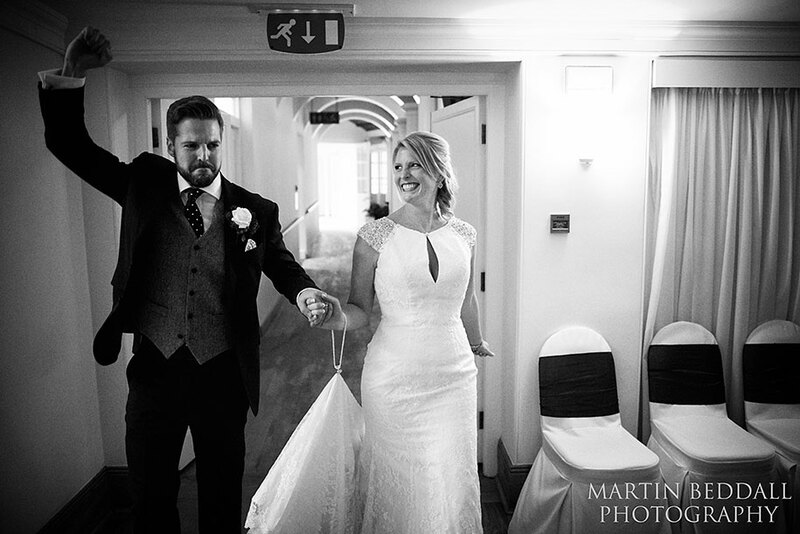 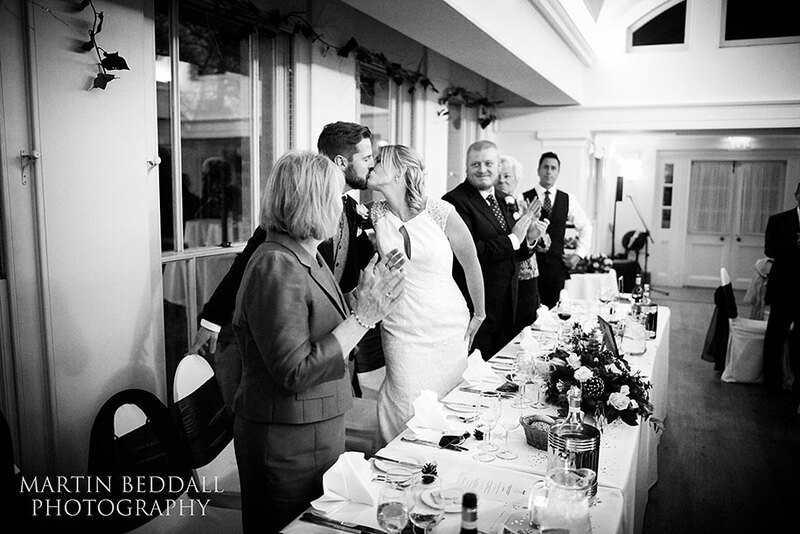 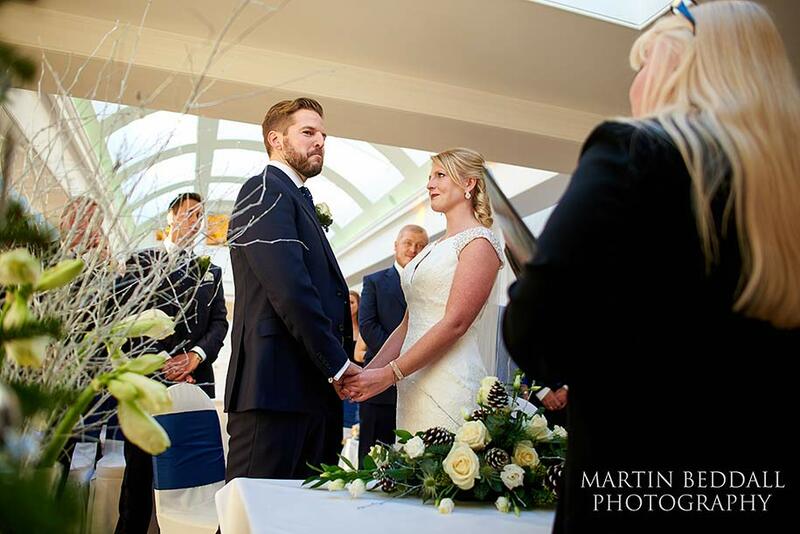 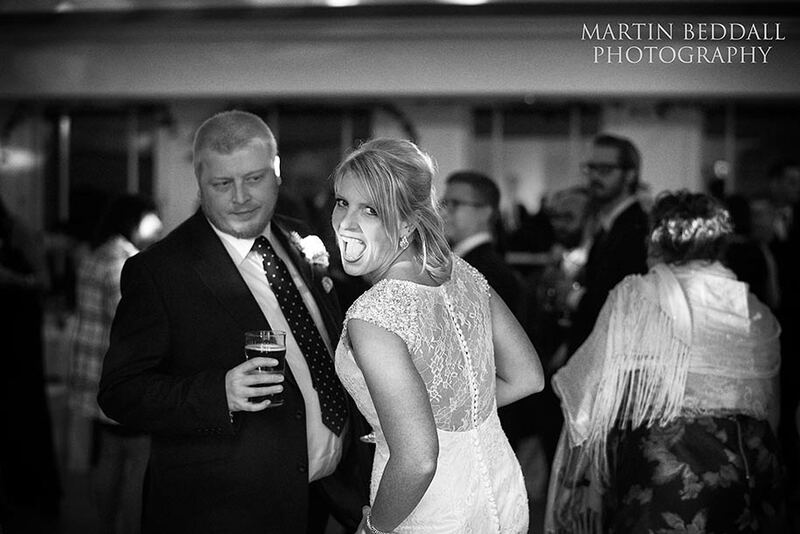 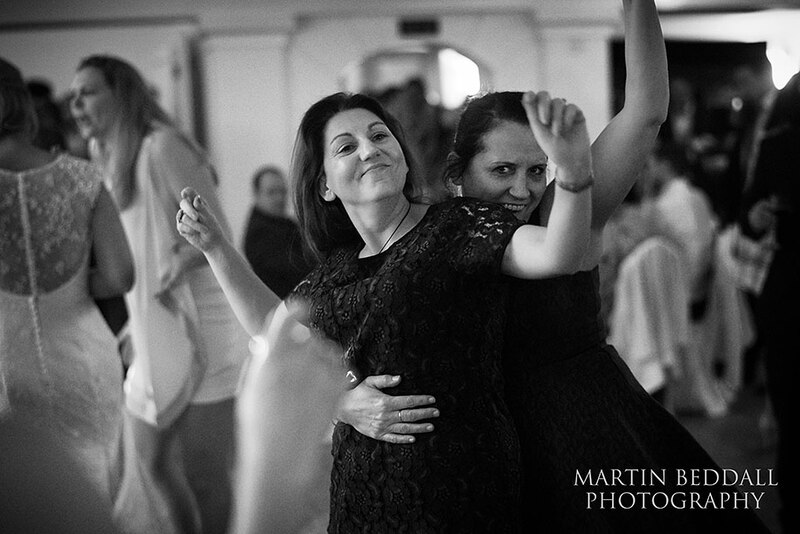 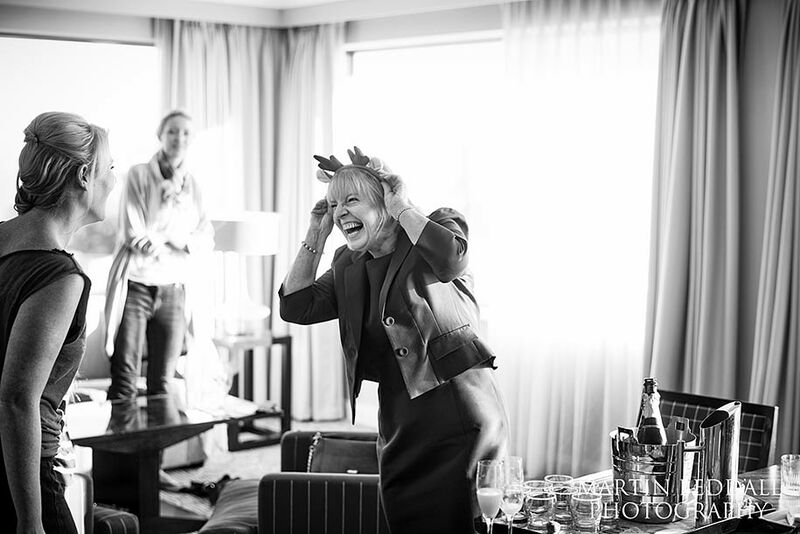 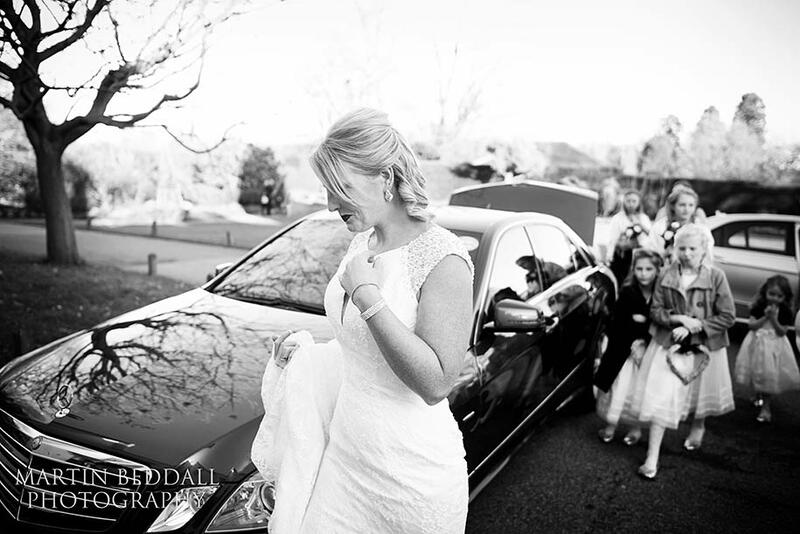 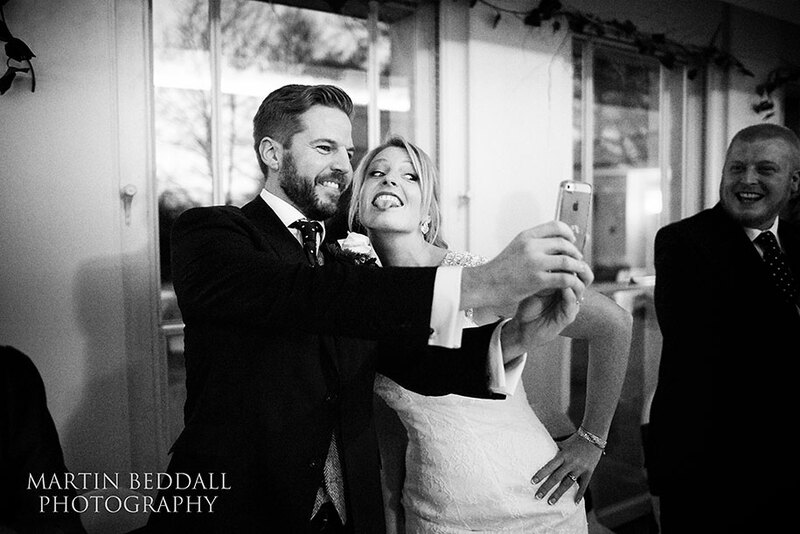 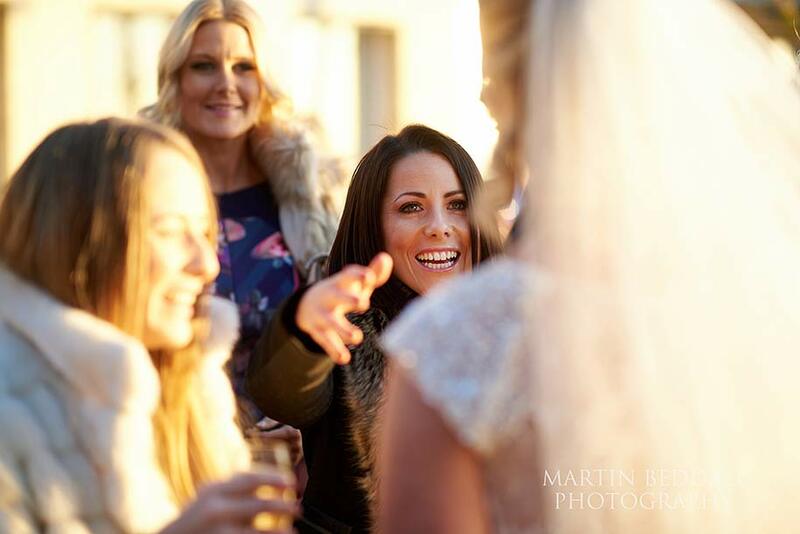 Those dice were rolled so well – a lovely wedding – a perfect winter wedding in the sunshine!